It was one of those cold winter’s days. The sun was nowhere to be seen. There was a coldish breeze blowing, and the clouds were periodically producing light drizzle. Not the most inspiring day to go cachimg, so we chose somewhere local to us, Camberley Town Centre. About 1.5 miles from where we live, this seemed ideal. If the weather got slightly worse, we could shelter in shops; if the weather got really bad we could retreat to the car and get home very, very quickly. 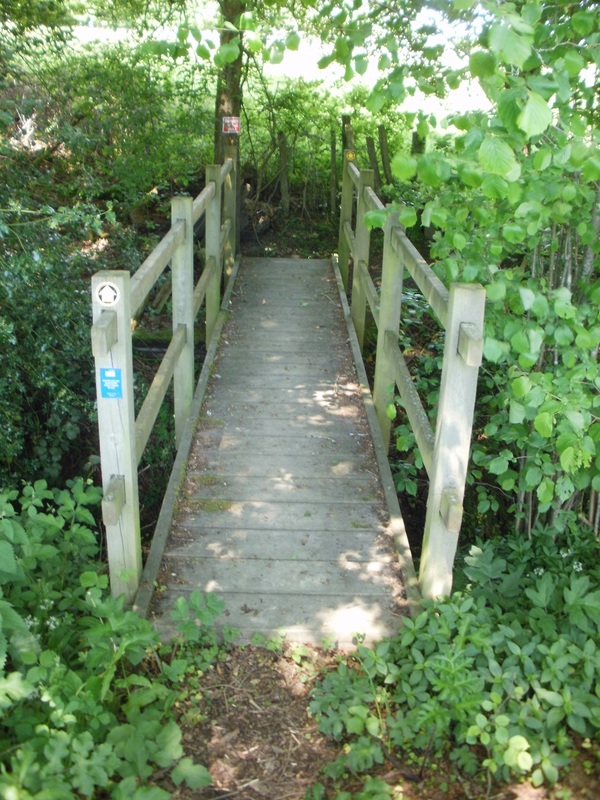 Fortunately we didn’t need either escape route as we undertook the Camberley Constitutional Cache. 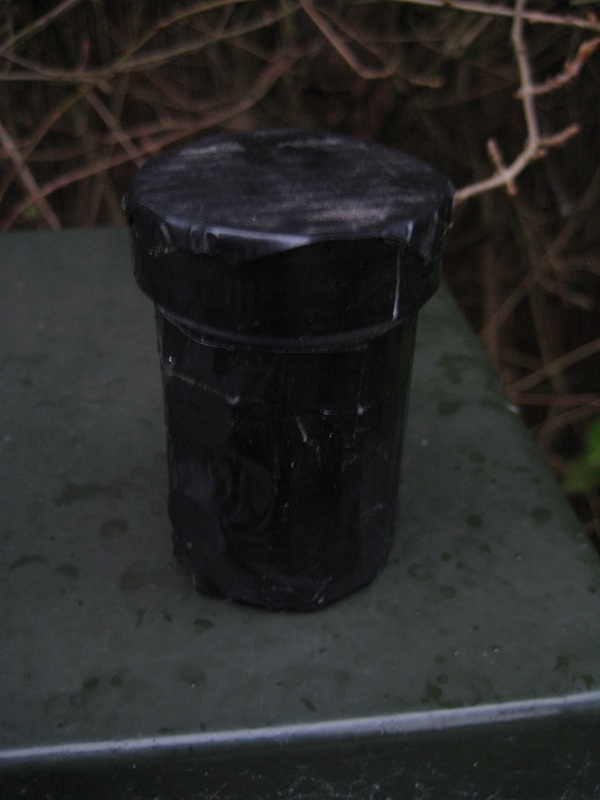 This multi-cache took us to 11 different locations near the centre of Camberley. 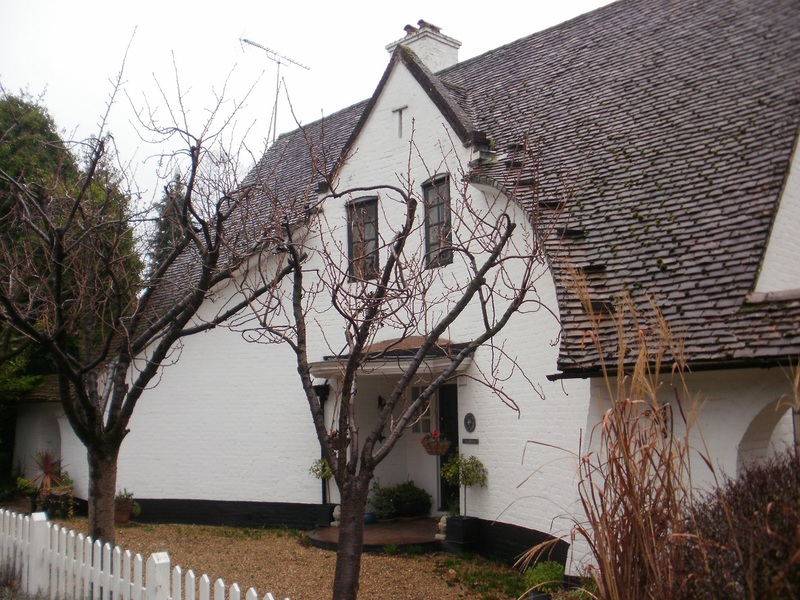 We started just to the south of the Town Centre and had to acquire information about a Grade II listed building associated with Sir Edwin Lutyens. 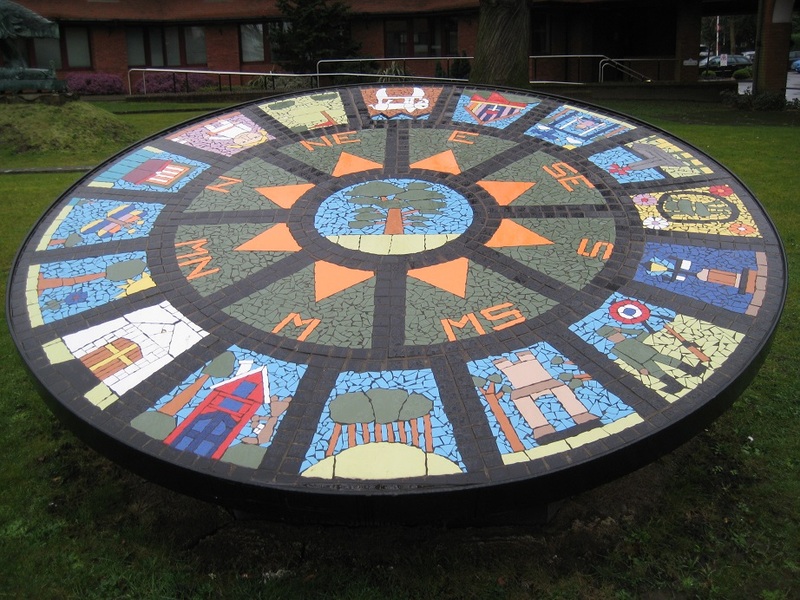 Now without meaning to disrespect Camberley, it is not one of the places one would naturally associate with Lutyens. A truly unexpected find ! We headed North towards the Centre, passing under the railway (waypoint 2), and walked to the Station. 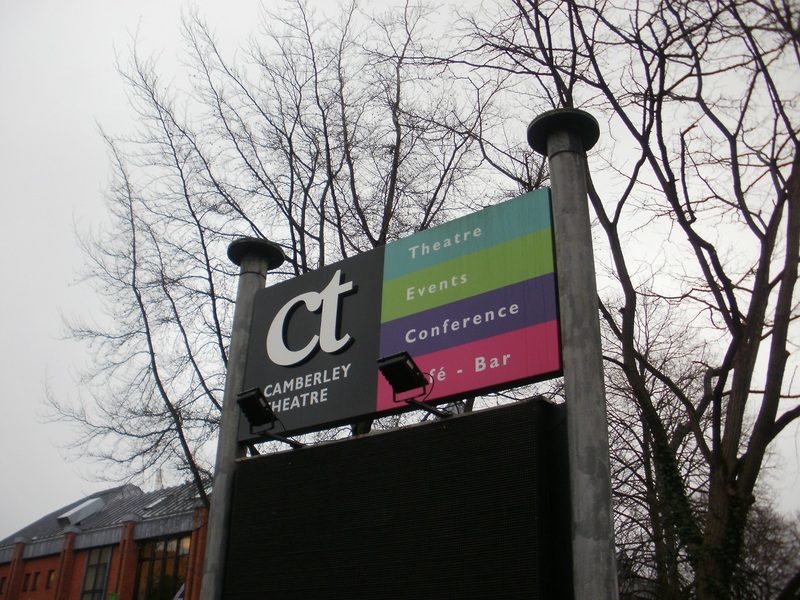 We resumed our Camberley Constitutional walk by passing the Theatre, Council Offices and Museum (a further three waypoints here). Then our route turned in toward the Town Centre, where we had a store name to verify (here, we almost miscounted the letters on the faded sign). Up to now our route had been quiet, a bit bustly, but then we had to walk along the A30. A major traffic route, and the noise level increased substantially. 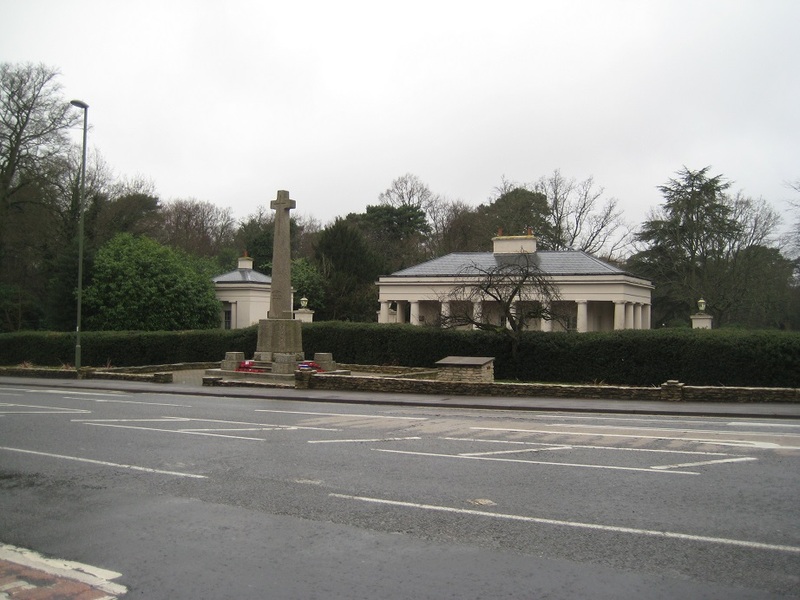 We collected another waypoint before crossing to the road to Camberley’s War Memorial. This stands outside the main gates of the Royal Military Academy (Sandhurst). 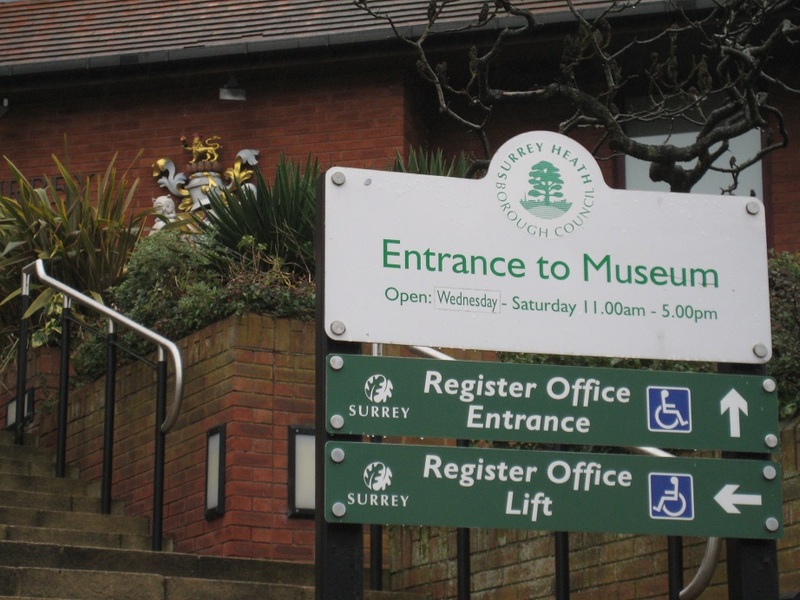 (Interestingly the rear entrance to the RMA is in Sandhurst, Berkshire yards from our house, but the main official entrance is in Camberley, Surrey !). At the War Memorial we had to find the lengths of various names, and derive a set of co-ordinates for our third multi of the day. We made a school-boy error here, as the cache owner had given a checksum for the final co-ordinates for the cache, but we calculated the check-sum on the numbers we had found. We double and indeed triple checked our numbers (to no avail) before heading off to a possible location where we did find the cache! It was only after emailing the cache owner afterwards did he point out our inability to read instructions! 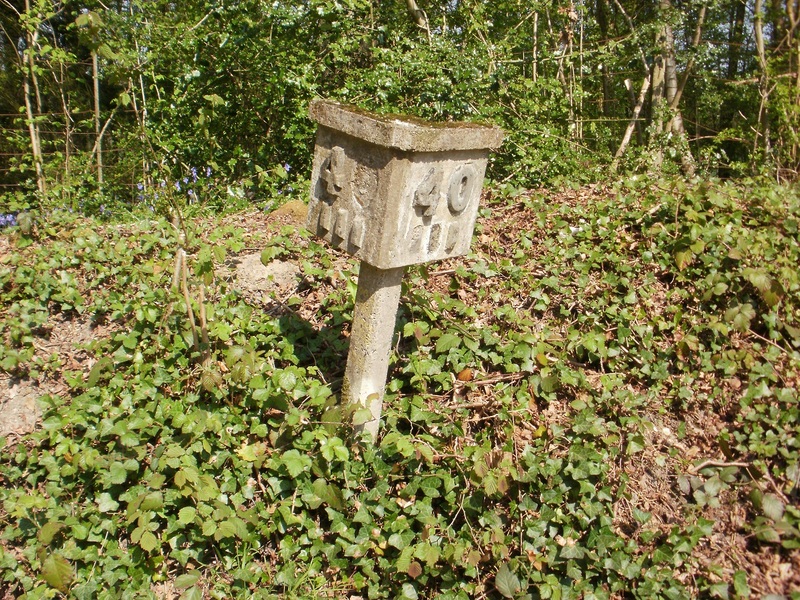 We had one more waypoint on the Camberley Constitutional to find on the A30. 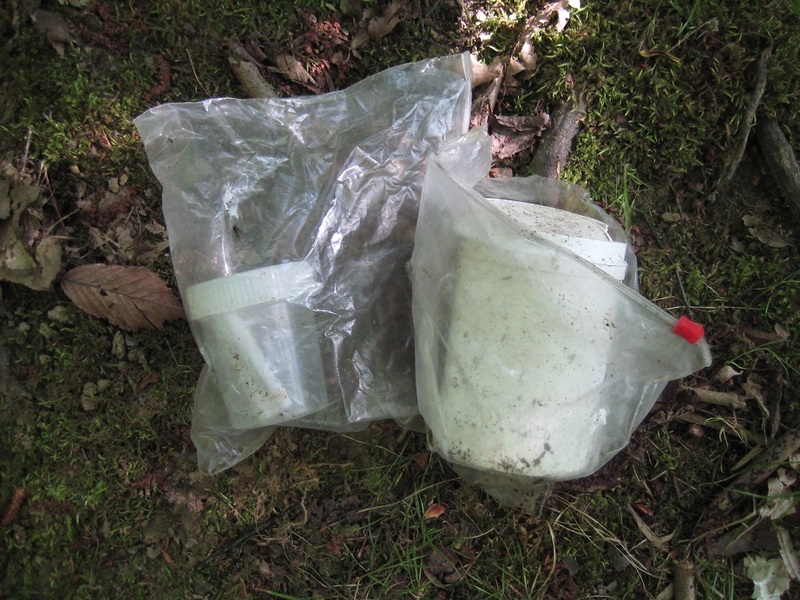 It was at a Church where a standard cache was also hidden (and if truth be told we took a bit too long finding the cache – unearthing cold, wet leaf litter on a freezing day was not our best strategy). 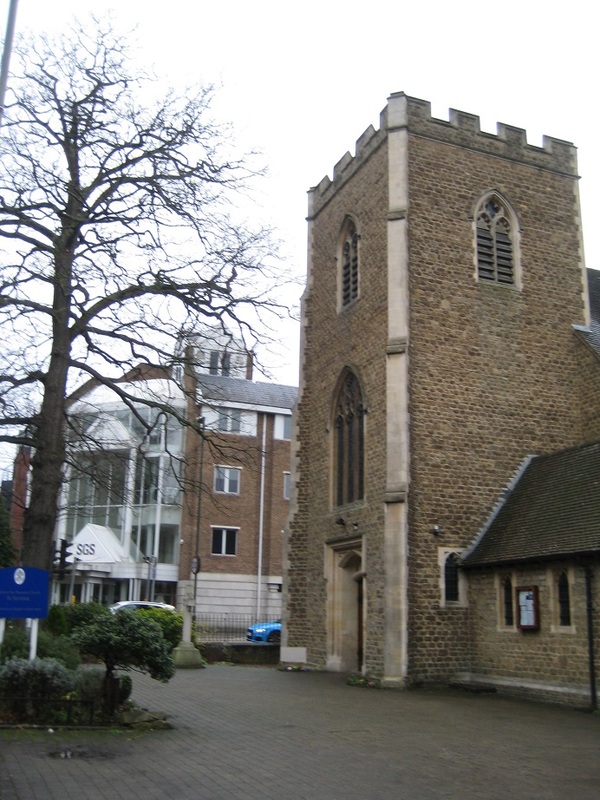 The Camberley Constitutional route took us past several churches – some modern, some much older. St Tarcisius Church was erected 100 years ago to commemorate those soldiers trained at the RMA who were killed during the First World War. Our Constitutional cache then took us away from the A30 (passing the Sports Centre – another waypoint) and through a park. We took the wrong exit out of the park (we mis-interpreted the term ‘diagonally across’ far too literally) and ended up heading back towards the A30! Whoops! We realised out mistake and soon found ourselves collecting the final waypoints on our walk. A swift calculation later and we arrived at the cache! Although the container and its hiding place were not special the tour around Camberley certainly was. 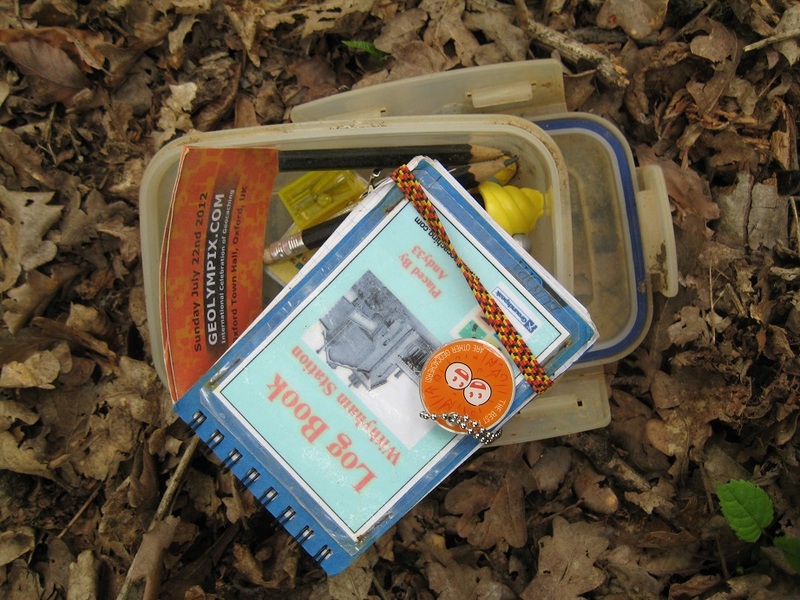 Caching really is educational! We had one more cache to collect. 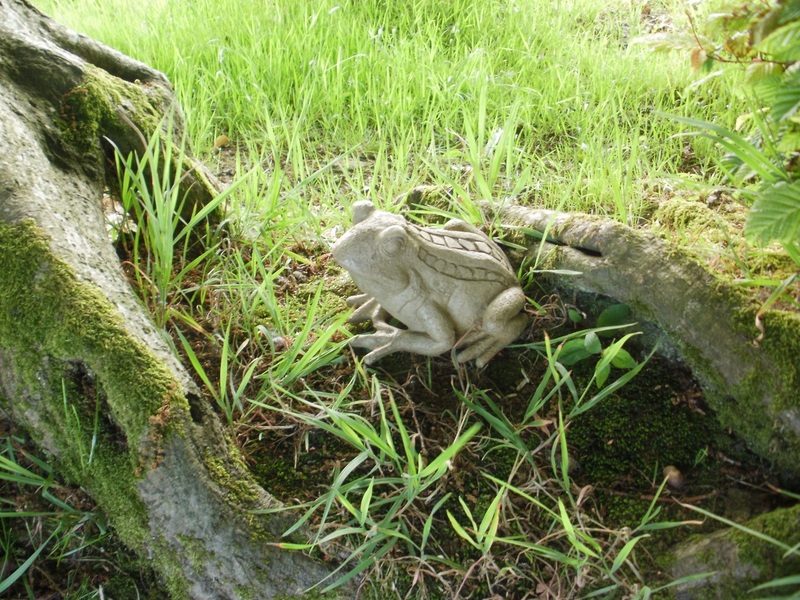 We had solved a puzzle cache before we left home (part of the Surrey School Days series). We correctly identified a person who had been educated in Surrey, before becoming famous in a particular film role, and is still on our TV screens today). We drove 2 miles around the residential streets of Camberley, but a shorter route – had Mr Hg137 turned the car around ! – was only 0.5 miles! A very entertaining, if cold, afternoon in Camberley. Three multi-caches, one puzzle cache, one standard cache and two very cold cachers! And the rain kept off too! We had just finished our unofficial, self-made long-distance path from Sandhurst (just in Berkshire) to Sandhurst (just in Kent). Woo hoo! Mission accomplished, that left a hot, sunny May afternoon free for enjoying ourselves, and we moved a mile or so from Sandhurst to Bodiam, just back over the border in Sussex. 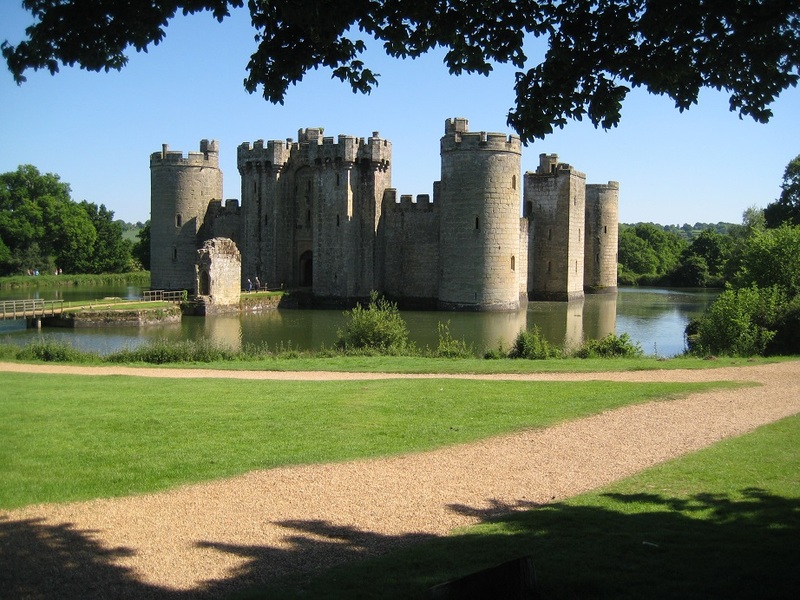 Bodiam Castle really looked the part of a castle, surrounded by a moat, standing square with towers at the corners and gates https://en.wikipedia.org/wiki/Bodiam_Castle It was built in 1385 and still looks very complete from the outside. Inside it’s more of a shell but there are rooms and towers to visit and steep spiral staircases inside turrets to climb to the battlements. 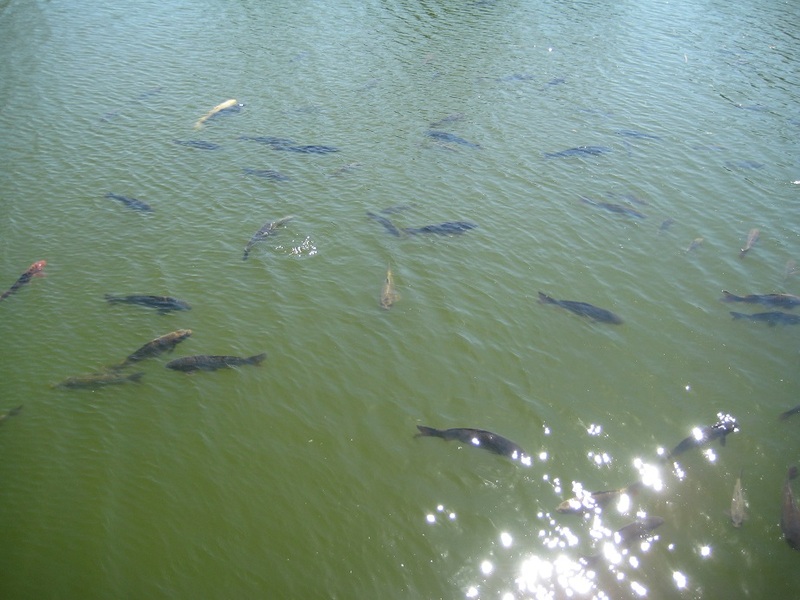 Once up top, there’s a view out across the nearby countryside with its vineyards, and down into the moat with its large and numerous carp. 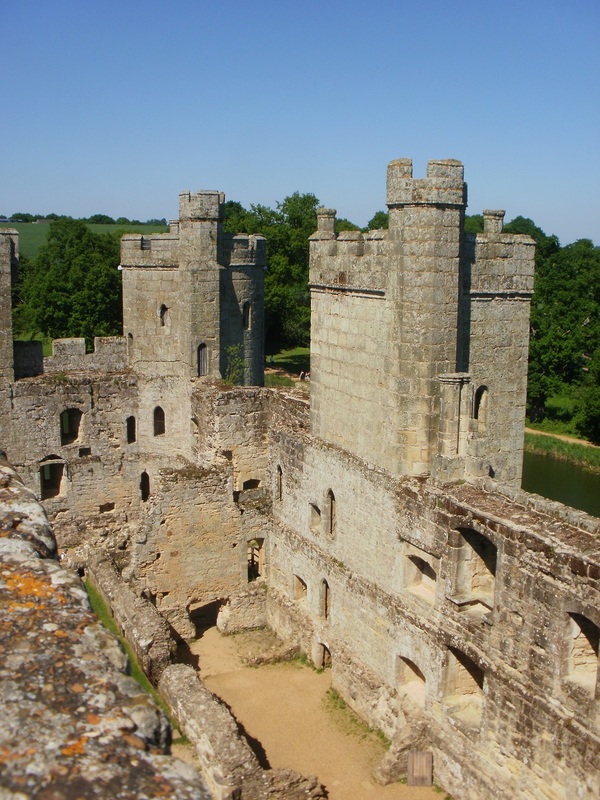 After about two hours we had ‘done’ the castle quite thoroughly, had climbed every uneven winding staircase, walked along the battlements, and visited every room. 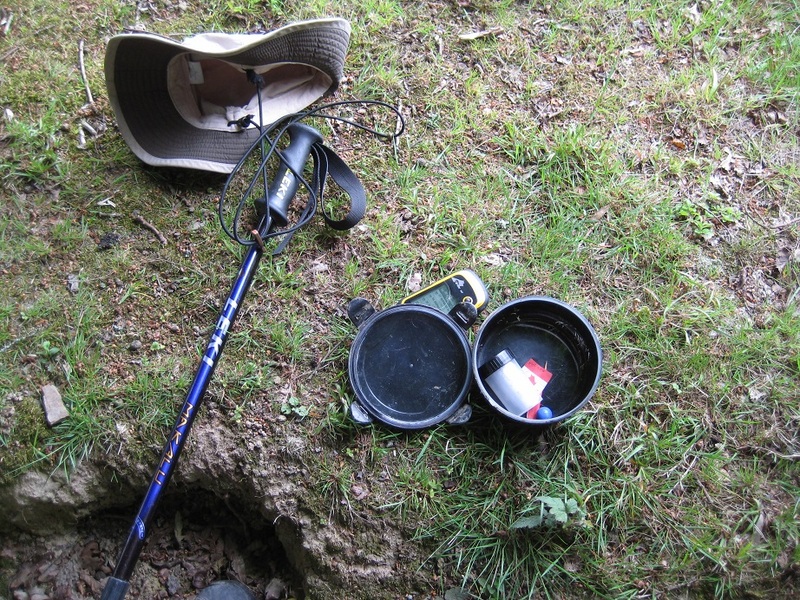 After a cup of tea, time for some caching! 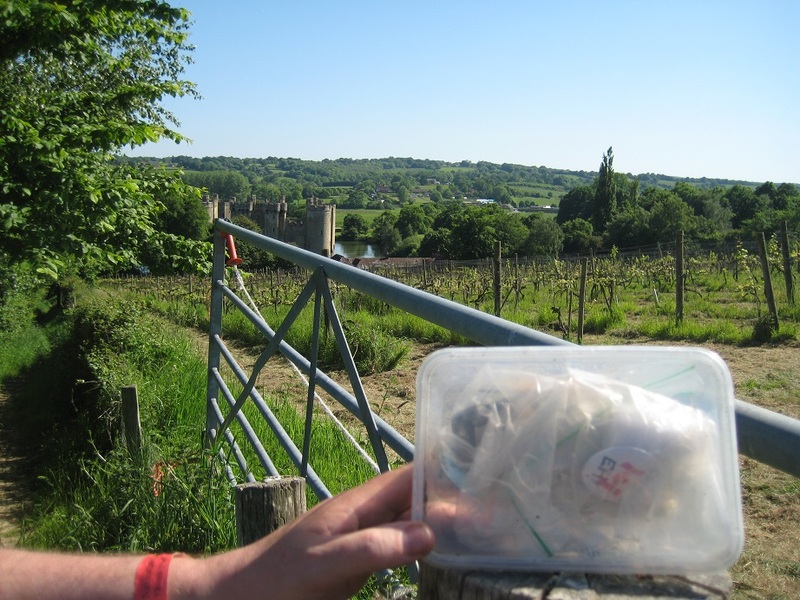 Our first cache lay uphill from the castle, along the Sussex Border Path, at the side of a vineyard. 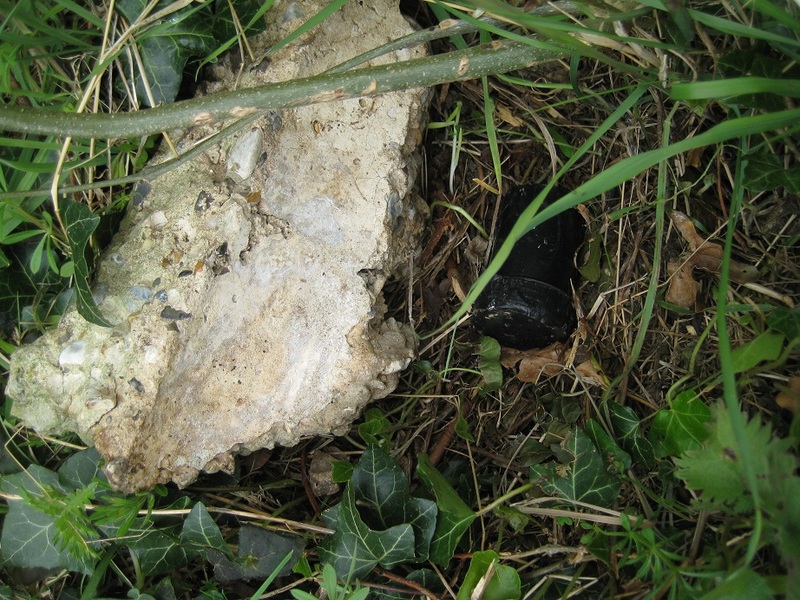 ‘Swine Bovine Equine’ was a very old cache, placed in March 2002 (that is extremely venerable in caching age!) and its name comes from the figures decorating the weather vanes of three nearby oasthouses. There is more history in the grounds of the castle, though much more modern, a World War II pillbox (to be more precise, a pentagonal FW3/28A variant, brick-skinned!) and there is a cache based on that. (More information on this pillbox can be found on this blog: http://wwww.pillbox.org.uk/blog/216726 ) We’d done the research beforehand, so didn’t need to look very closely, and the cache container can be found a little way away, outside the castle grounds. The cache description says that the National Trust expect visitors to pay before entering the castle grounds and walking past the pillbox; we did that anyway as we were visiting the castle … but that path is also a public footpath, part of the Sussex Border Path, and I think you could walk along that anyway, without paying. 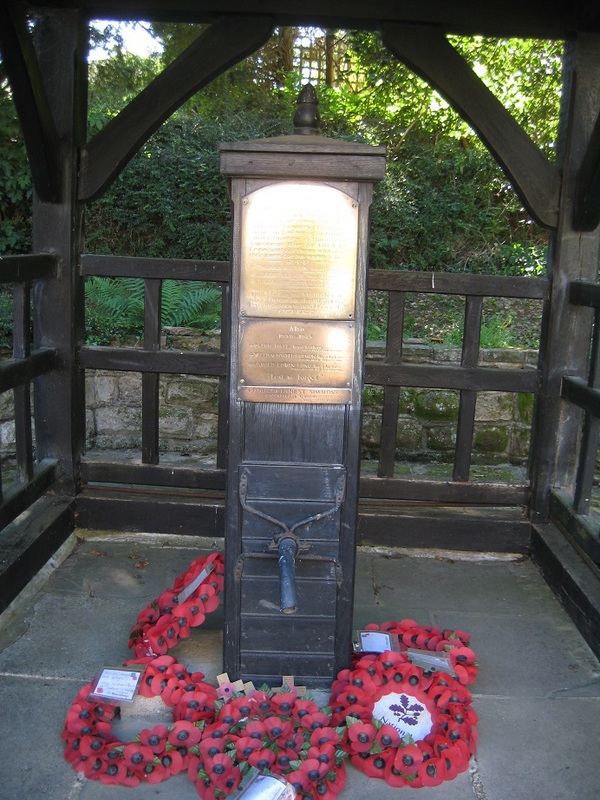 Past the castle and moat, we turned uphill away from the castle to look for another cache, hidden behind a decorated village pump, which is also a war memorial. More about this can be found here: http://www.roll-of-honour.com/Sussex/Bodiam.html It was somewhere we had driven by earlier, almost without noticing, and would not have stopped. While researching for this post, I came across a comment on the cache logs which was written on the logs after our visit … ‘Message from a Bodiam resident THIS IS A WAR MEMORIAL Show respect’ I agree: we should, and did, show respect; but from another viewpoint, the cache brings visitors who would not stop here otherwise, and who keep alive the memories of those commemorated there. 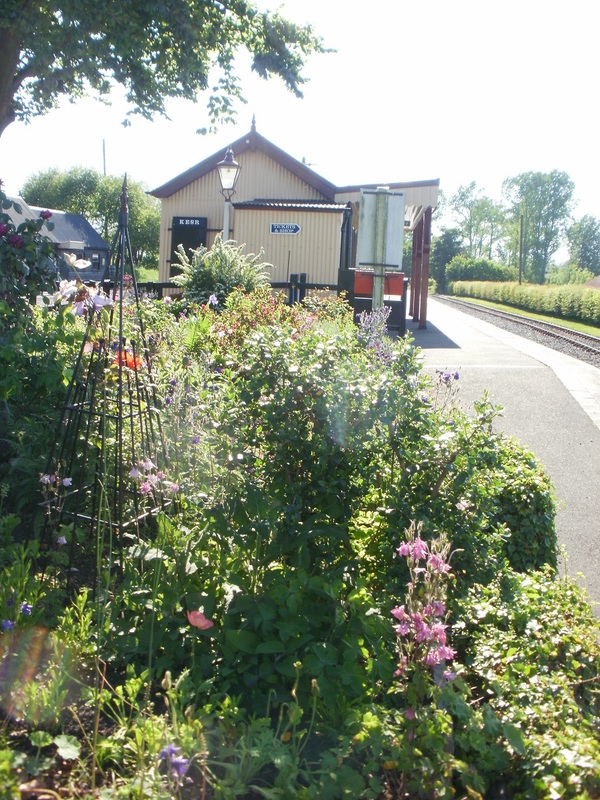 But there is more to Bodiam than the castle: just over the River Rother lies a station, which forms one end of the Kent & East Sussex railway, the other end being at Tenterden https://www.kesr.org.uk It had its heyday during hop-picking times, and is now a heritage steam railway. 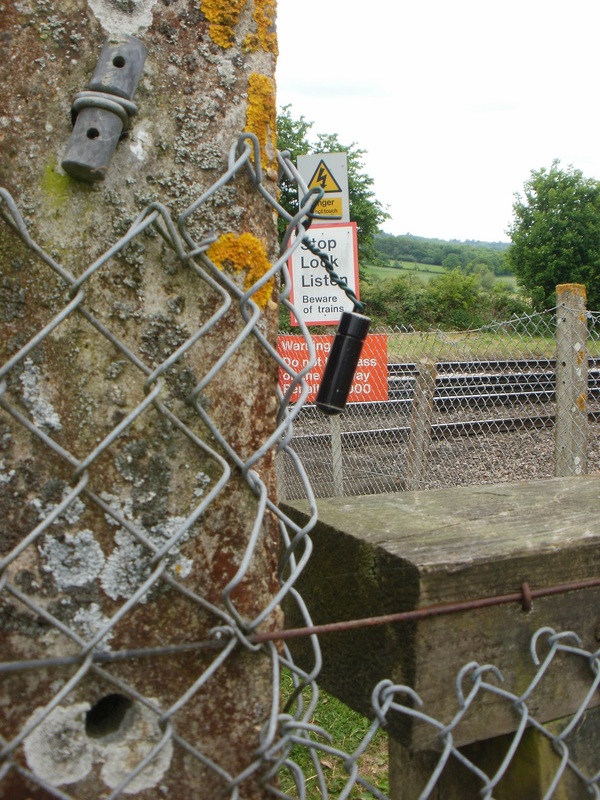 And, as there was a station, there was a cache to be found there, from the ‘Sidetracked’ series. Could we find it? We gave it a very long search, staring at every possible place it could be hidden, including a very suspicious large stone tucked behind a fence post. 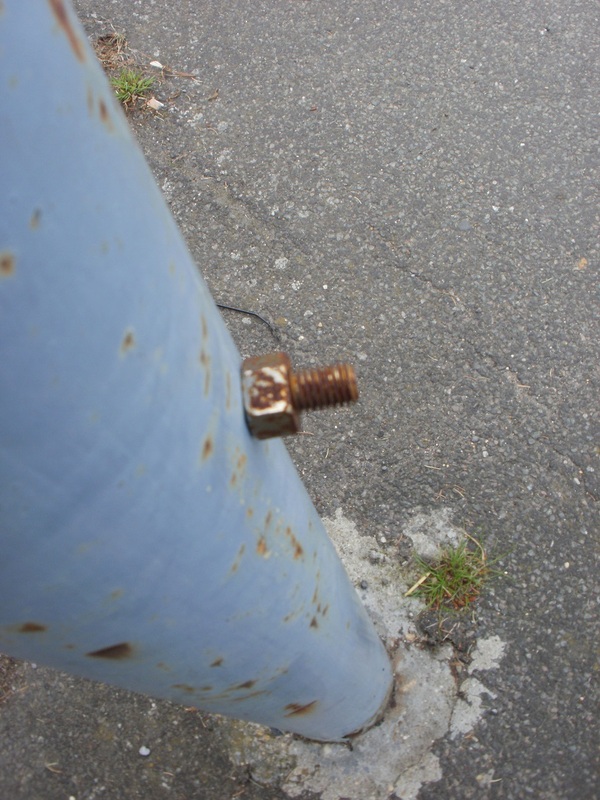 But we couldn’t find it … no-one else has found it since, and it’s been temporarily disabled. It goes missing quite often, according to the logs. It was now about 5pm, and still very hot, and we were beginning to wilt, as we had been out walking / castle visiting / caching all day in the sunshine. We had just one more cache to attempt, sort of on the way back to the car. 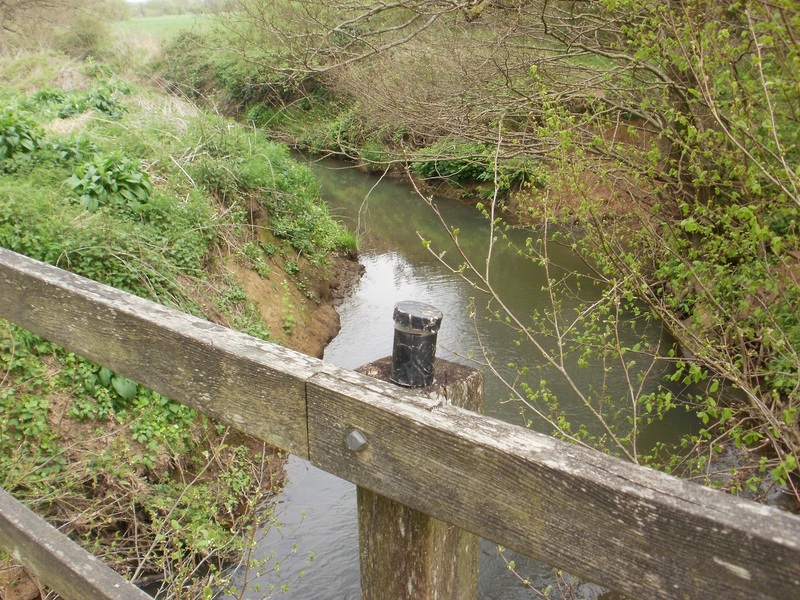 Once back at the bridge over the River Rother, we then diverted along the path along the riverbank. A little way along was the final cache, ‘Castle View’, which really did mark the spot for a splendid view back to the castle nesting amongst trees just above the valley. Facing the other way, there was also a splendid view of the station and railway: A well chosen spot indeed. And that was it for the day: time to head back to the hotel for a rest, a shower and a meal, in no particular order. 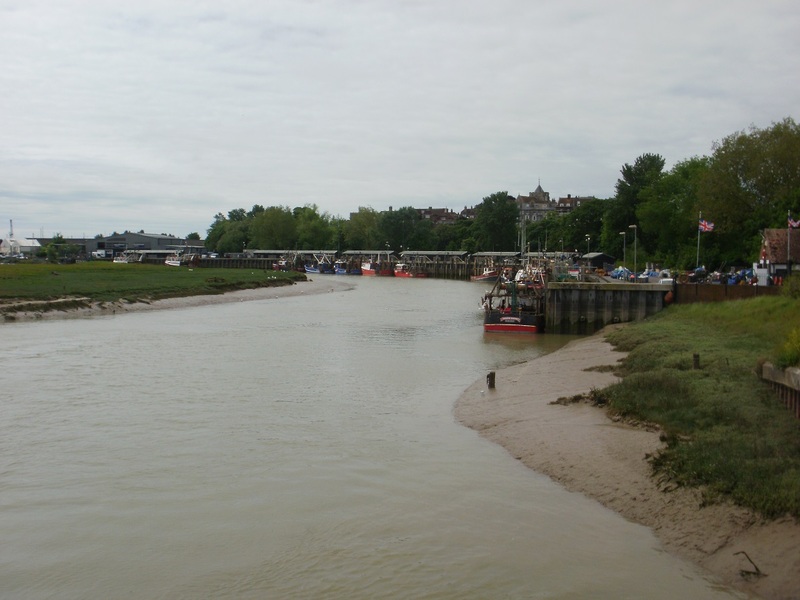 Part way through our week’s holiday in Hastings, we took a day away from sightseeing to tackle the penultimate leg of our unofficial, self-made long-distance path from Sandhurst (just in Berkshire) to Sandhurst (just in Kent). 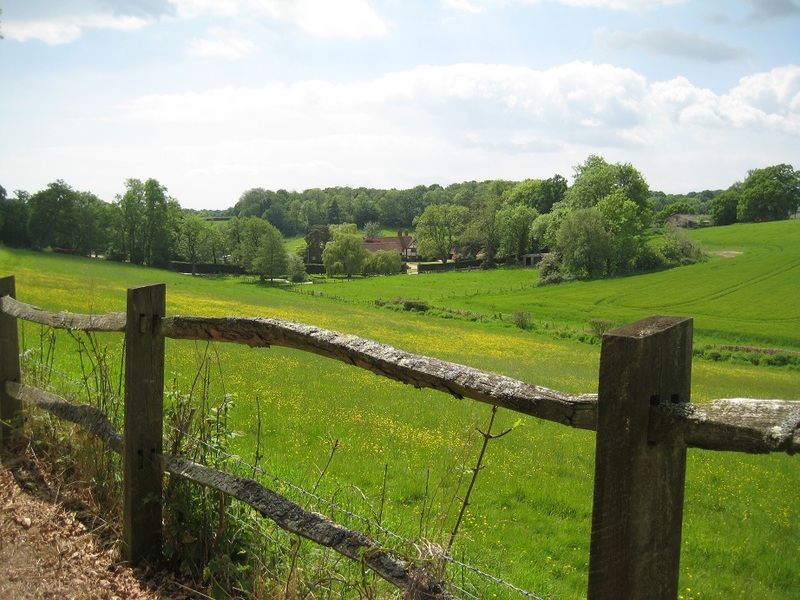 Today’s route was from Stonegate station to just a few yards from the Kent border near Hawkhurst Fish Farm. Leaving the station car park (where do all the passengers come from? 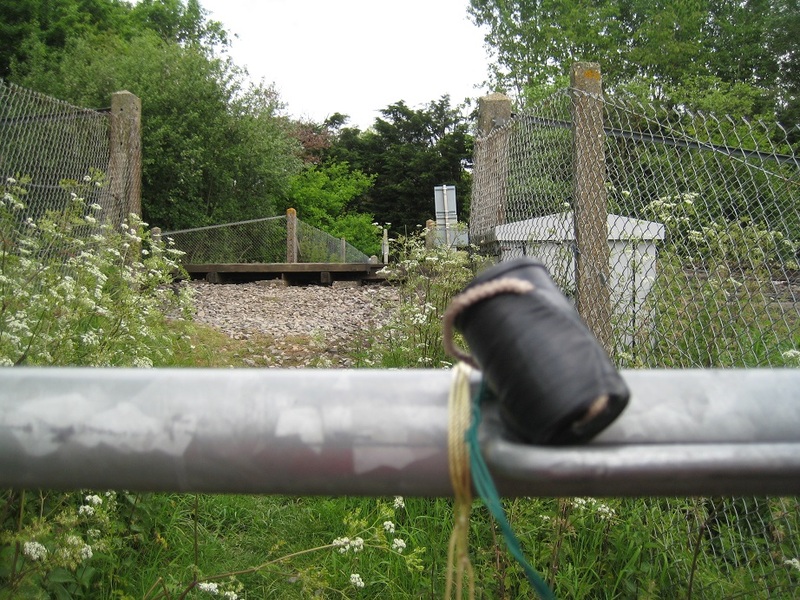 It’s in the middle of the countryside), we set off roughly parallel to the railway, along a farm track, stopping to talk to the farmer, and then on along a grassy path at the edge of a field to find our first cache of the day, part of the ‘Burwash Bash’ series. 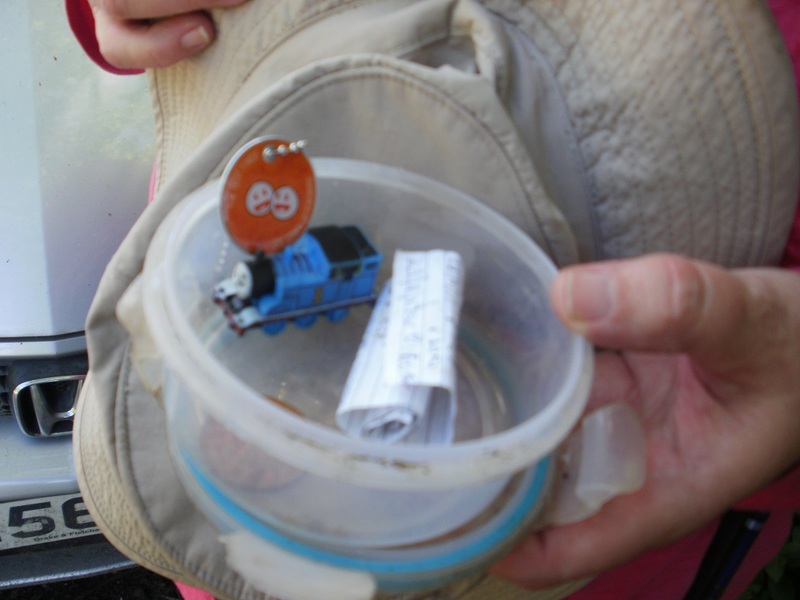 And it was a pretty good cache, hidden away inside the innards of a plastic creature (think ‘rivet’, ‘rivet’, ‘rivet’). Just as we replaced the cache two people came along, armed with maps and clipboards. They were researching a long-distance route of their own. We explained about our own mission, and about what we were doing, lest they thought us suspicious/mad, pointing vaguely in the direction of the cache. 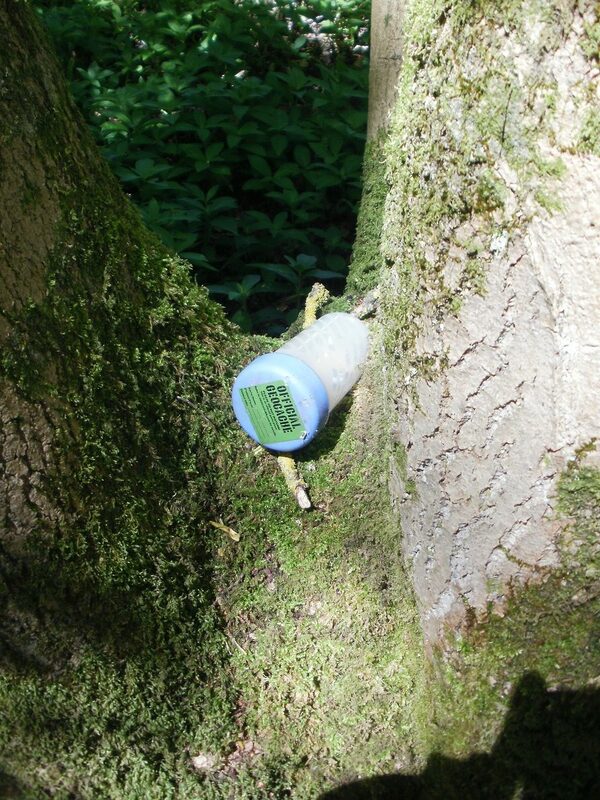 We followed the two walkers, who got ahead when we stopped to find the next cache, in woodland, hidden in a fallen tree among a selection of numbered insect traps/nests? we didn’t know what they were for. Further on, we briefly crossed the railway tracks to find a cache in a gate, then returned to walk through woods, where we found … a dump of abandoned model houses … very odd. … And why are these here? 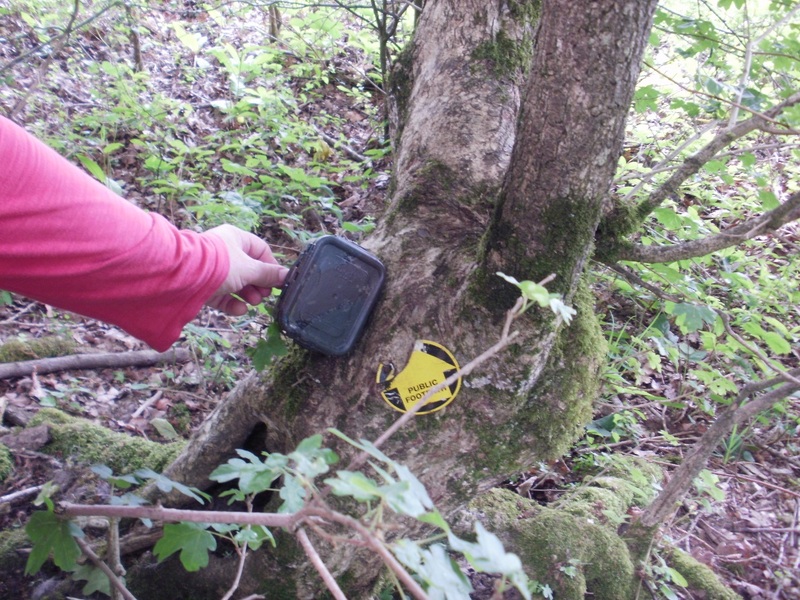 A little further on in the woods, we came across a couple putting pieces of red tape round some of the trees. They left when we appeared. 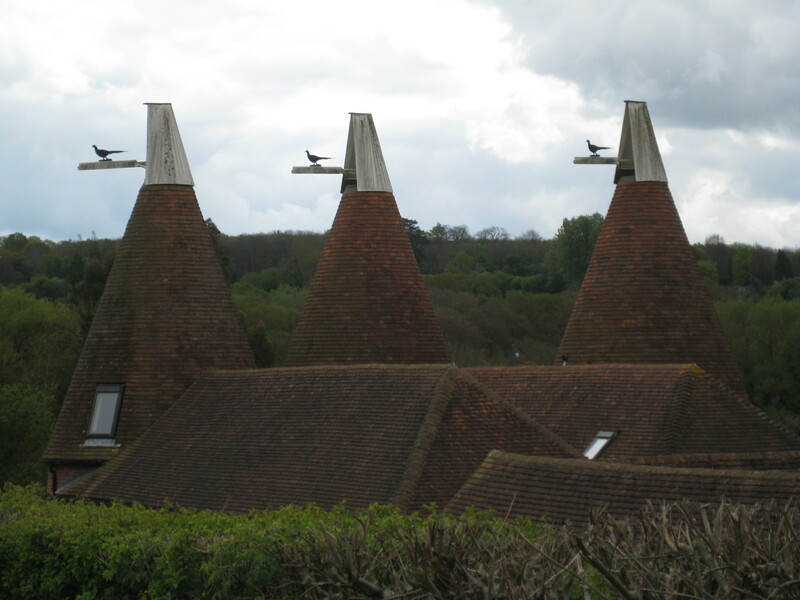 There are some strange people and things in this bit of Sussex! 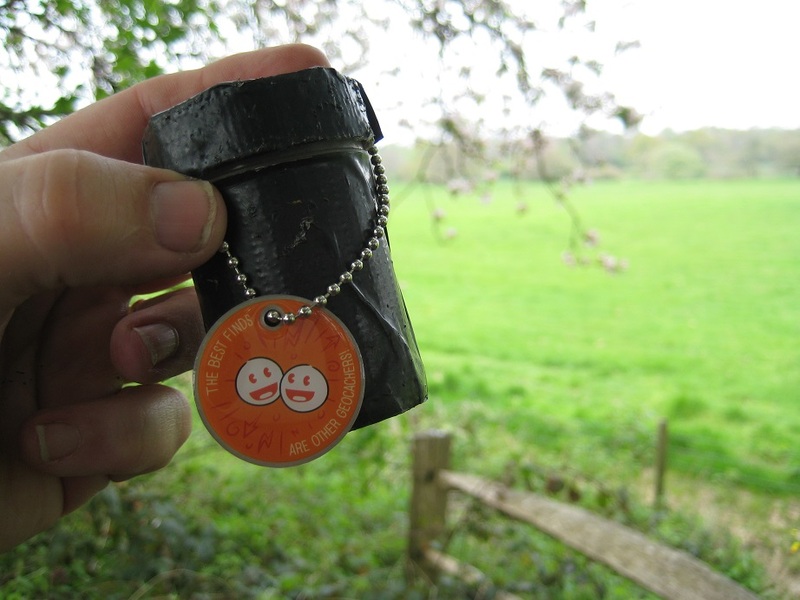 Two more caches were found, the first overlooked by a passing runner, and the second watched from above by a gang of railway workers. 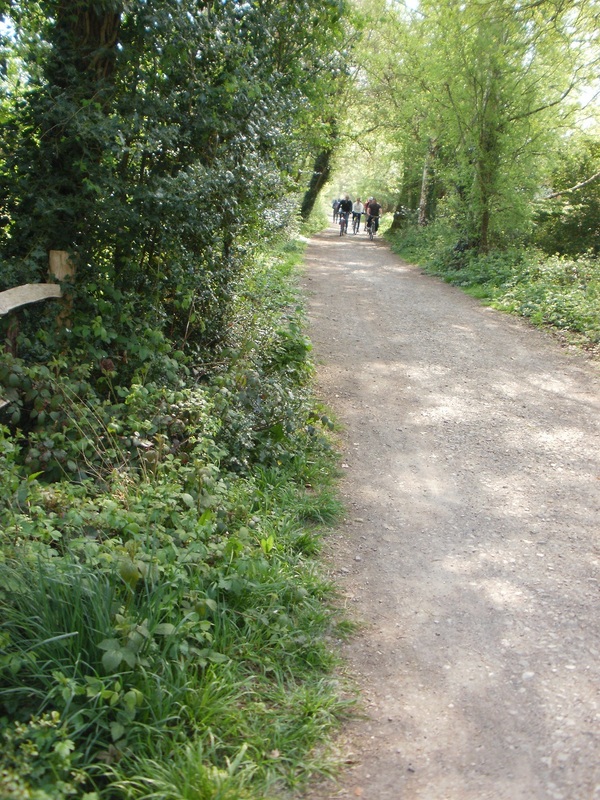 We had seen about twenty people so far; this wasn’t the quiet path in the country we had expected! 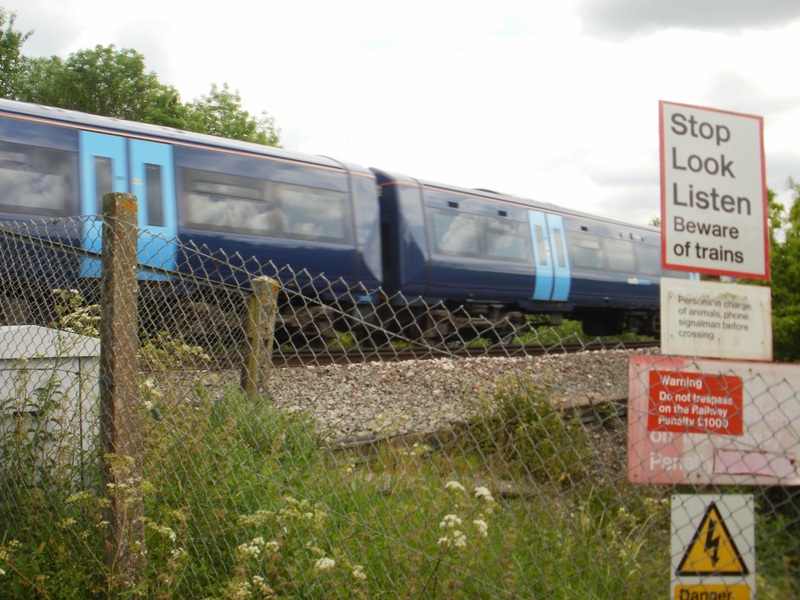 We turned uphill away from the railway and things went slightly wrong. There was a footpath diversion, but it was only signposted from the other direction, and, unknowing, we emerged onto a road in a place we weren’t expecting. Then we couldn’t find where the diverted path continued, and accidentally walked down a farm drive before re-finding the path. We were only certain we were back on the right path when we found the next cache. We carried on uphill, finding caches as we went and dealing with more bits of uncertain path signage. At least the series of caches was keeping us on the right route! OK – advert over – we stepped onto the tarmac, on a hot day with the early afternoon sun reflecting from the road, and walked along the road and up the hill into Hurst Green. Two and a quarter miles later, we sat on a seat in the village for another drink of water. Refreshed, we walked up to the A21, and found our first cache for a while just up the road. That done, we crossed the busy road, set of down a track, and were almost immediately away from the busy village and in open country once more. It was just a couple of miles more back to the car at the end of the walk, and there was one more cache to find, about midway. 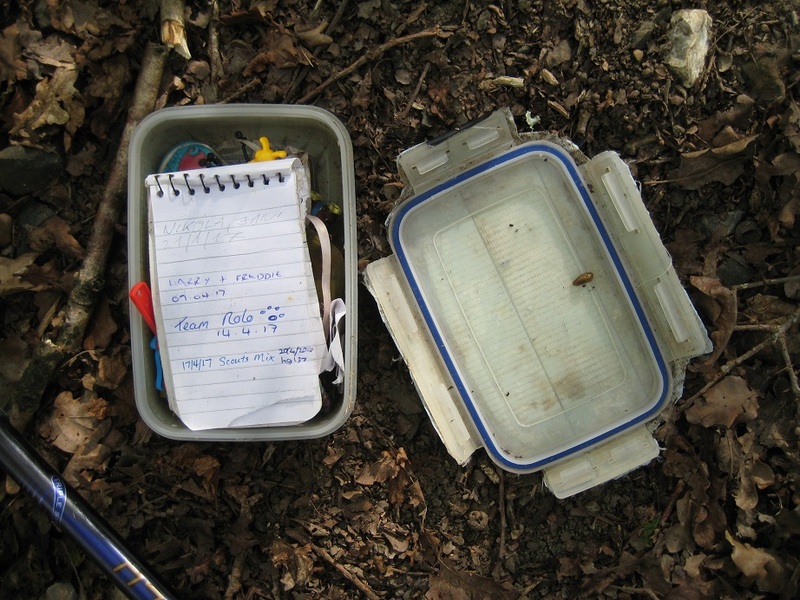 Called ‘Pond Bay’, it was to be our 1900th cache, so we spent quite a while looking for it; it hadn’t been found for 9 months, since August 2016, and it wasn’t quite where the GPS should have been … but find it we did. Then it was just a mile back to the geocar as the afternoon cooled. 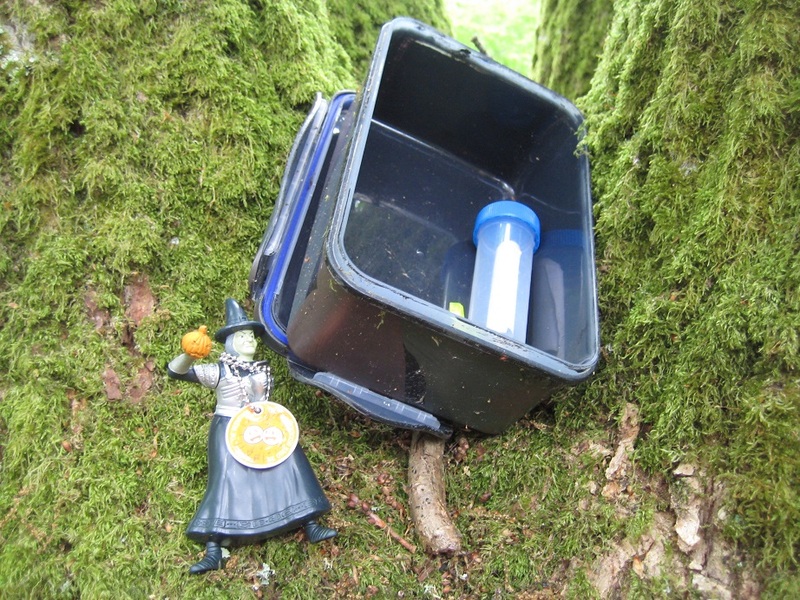 Fifteen caches found, and just one more walk to go until the end of our quest. Our previous day’s caching had been quite long with lots of sightseeing and a double caching trip. We therefore decided to have a more restful day… in the car. 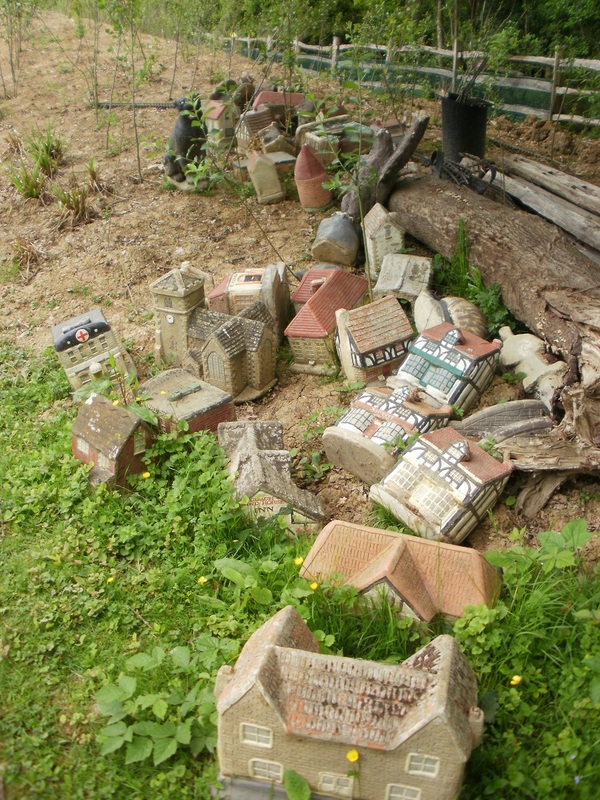 We would drive to Winchelsea, wander around, grab a couple of caches. Drive to Rye, do likewise. Similarly in Lydd. If time permitted we would even visit Dungeness. And, unusually for us, we more or less, stuck to this plan! Winchelsea lays claim, or so its says on Wikipedia, to being Britain’s smallest town and with only 600 inhabitants, it must be jolly close. 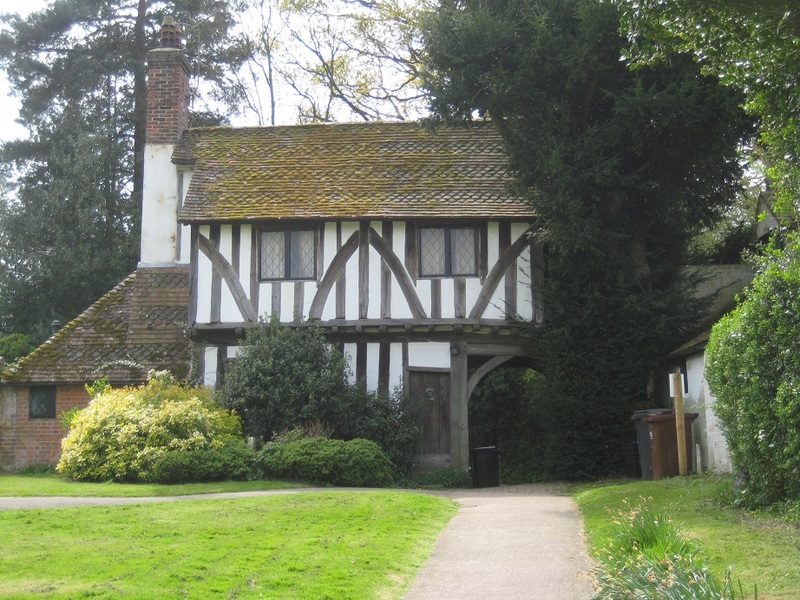 The town is now about 4 miles from the sea, but up the 13th century was on the coast. Sadly two very large storm waves destroyed the (old) town, and the new town was rebuilt on a grid system from 1281. 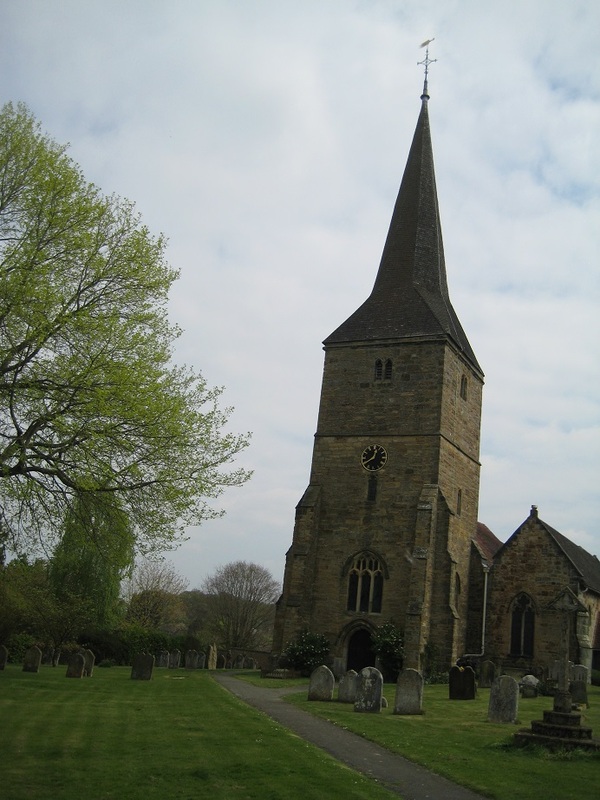 We had three caching targets in the town, the first being a Church Micro. We knew from the description and the hint, it would be on a seat just outside the churchyard. But as we arrived, on both sides of the road there were two long bus-queues of people. Muggle central! We took evasive action by visiting the Church. Unusually more ‘square’ than an oblong cross, but full of beautiful windows and tapestries. Outside in the churchyard we had two more attractions. 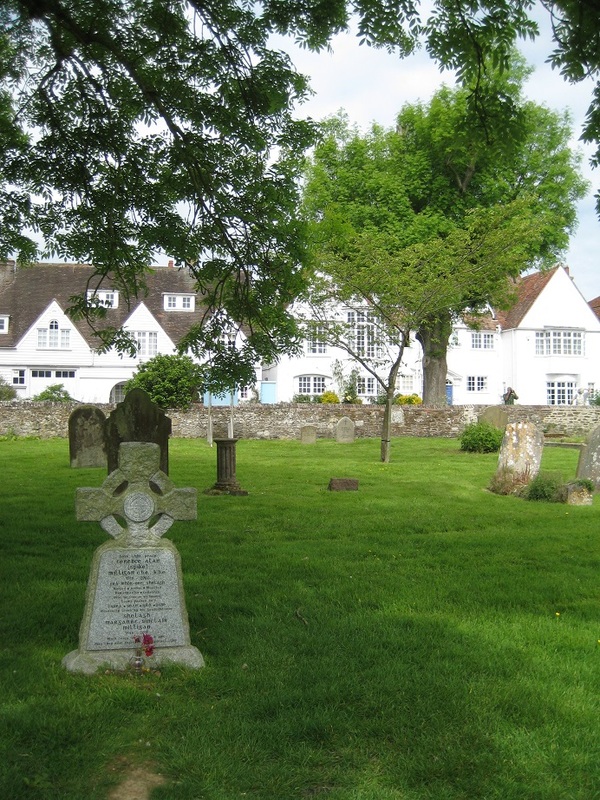 The first, the grave of Spike Milligan, which we only found by asking a churchwarden. 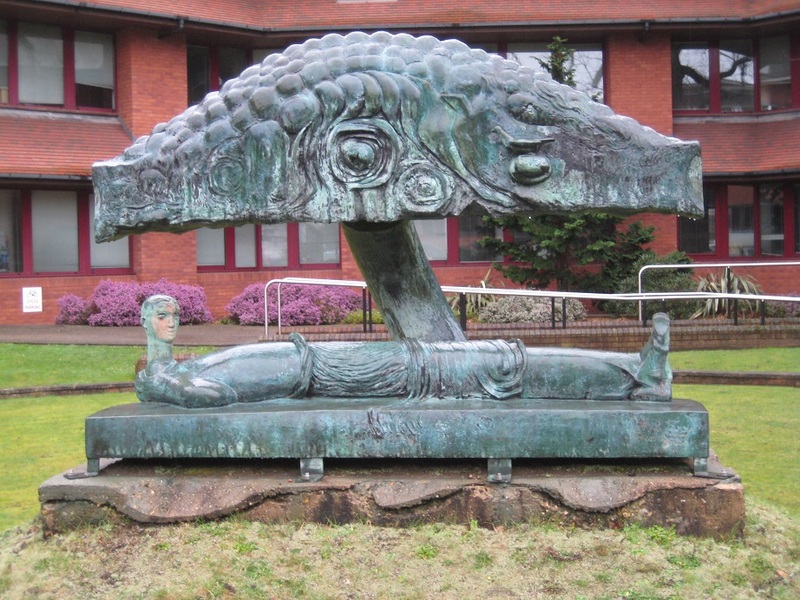 (Interestingly the famous quote on his grave… “I told you I was ill”, is almost an urban myth. Yes, it does include the text, but it is written Gaelic, as the Church wouldn’t allow it in English!.) The other attraction was a tree planted to commemorate John Wesley’s last outdoor sermon in 1790. Sadly the tree was uprooted in the 1920s but another now stands in its place. The queues had gone, so we headed out of the churchyard, passing a large group of German hikers as we left. We wandered to GZ, a seat, and as we were about to search we were aware that three of the German party were ‘looking for something’ the other side of the churchyard wall. Was it Spike Milligan’s grave? No. Was it John Wesley’s tree ? No. They were cachers. Or at least one of the was. We quickly signed the log, and re-hid the cache for her to ‘re-find’ it, before rejoining her party. Nice meeting you Schatzhasi! We decided to omit our second Winchelsea target cache, as the pavement away from the town disappeared and we didn’t fancy the road walk. 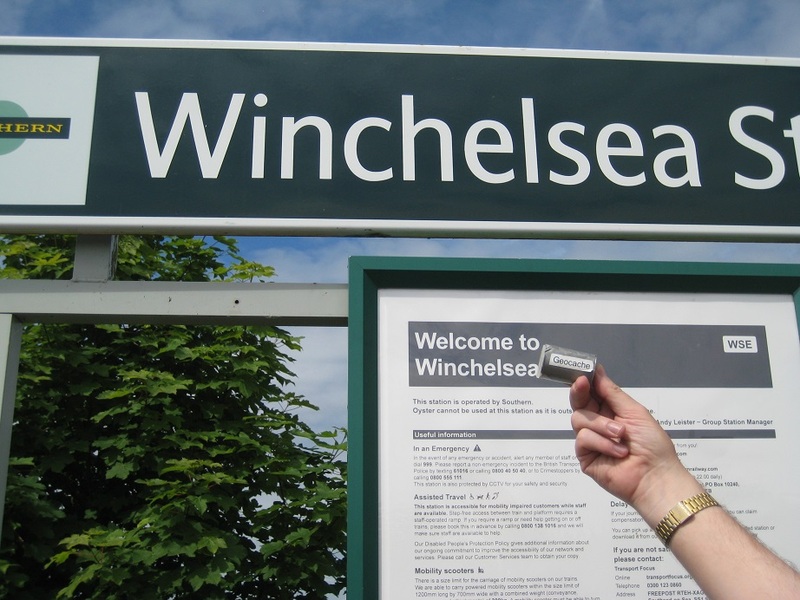 So instead we drove to Winchelsea station (some way from the town), and did a quick cache and dash! Or should have been! Two workmen were busy nearby, so some stealth and diversionary activity was called for. Log signed, we drove to Rye. 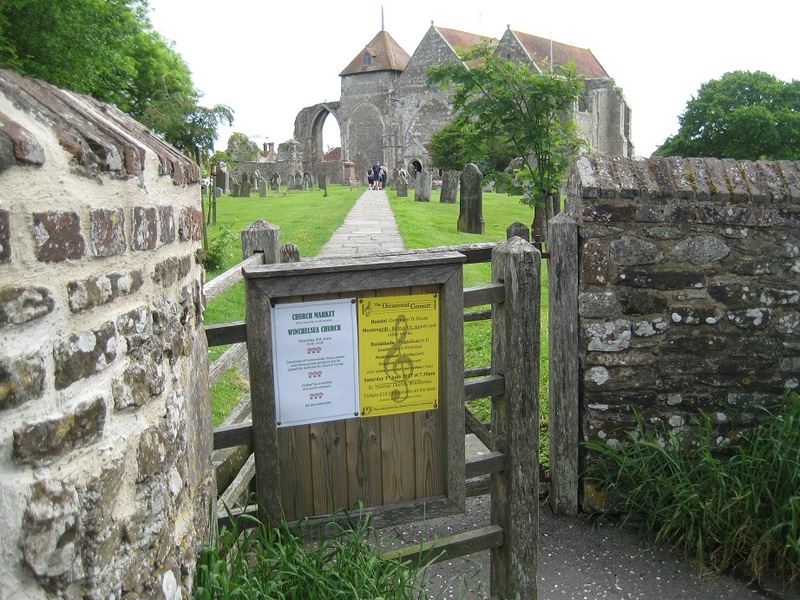 Winchelsea had been busy, in a ‘quiet busy’ sort of way. Many people, but everyone going about their business. Rye, though, was completely different. It was heaving. Rye residents shopping, tourists walking around (we counted at least 8 50 seater coaches), and a plethora of car parks for tourists like us. 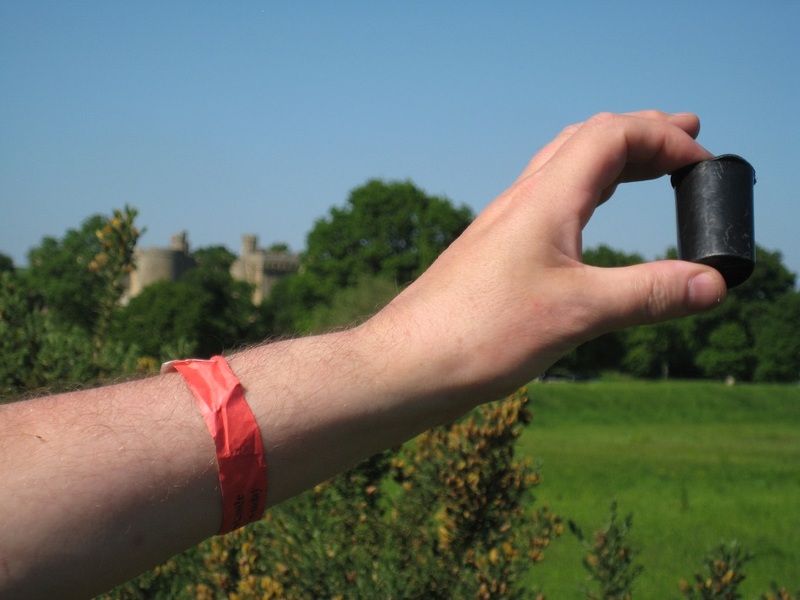 Rye is only a small town (population 5000), but somehow manages to squeeze 8 caches within its town centre. 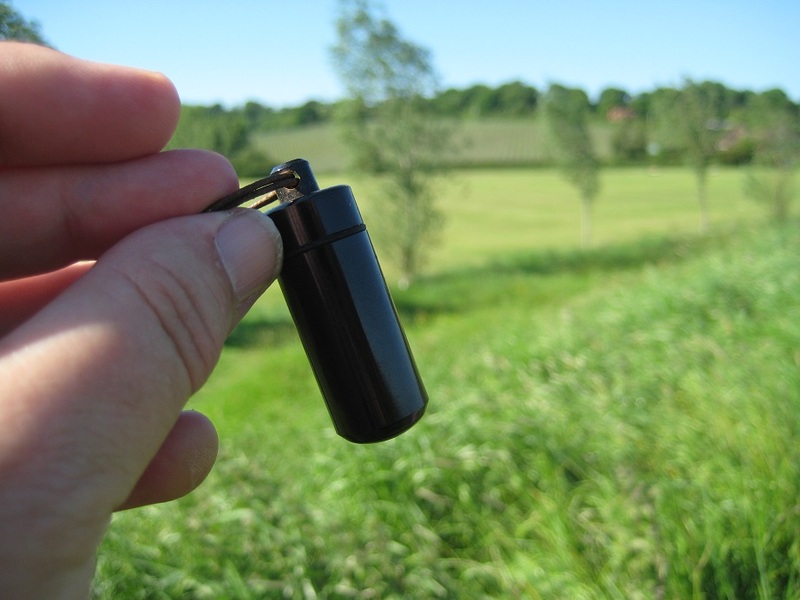 All the caches were film canisters, but most led us to places of interest. (The one exception being a car park in the centre of town). 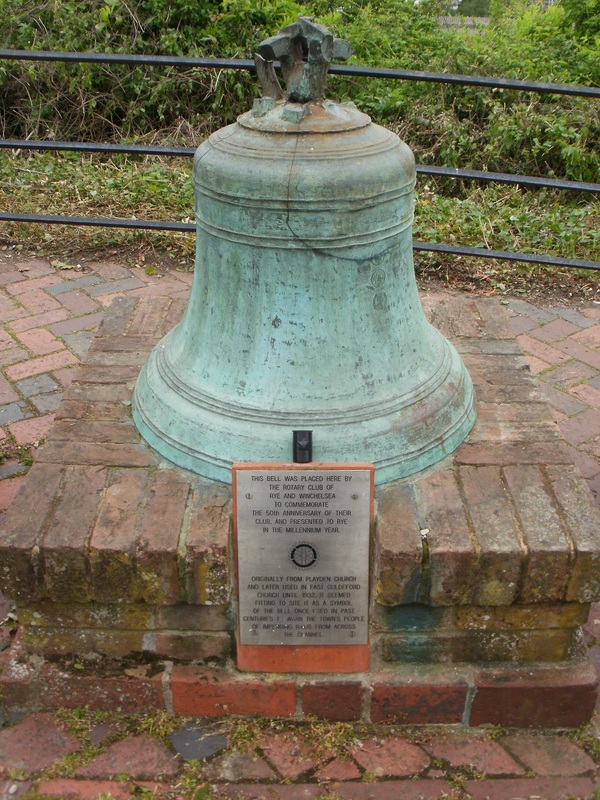 The remaining caches had been placed near the fishing quarter, a town gate, a church, a tower, a watchbell, a quay, the railway station and a windmill. 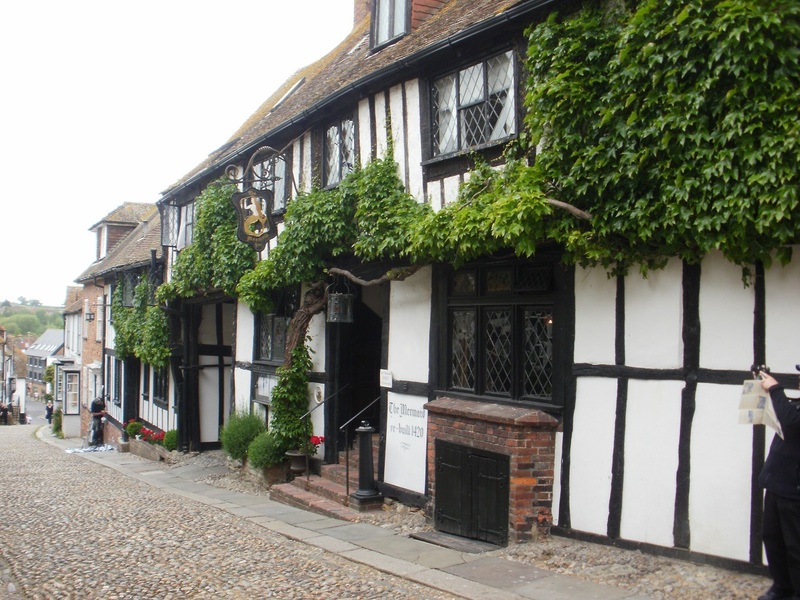 Rye’s most scenic road, the cobbled Mermaid Street, was devoid of caches but as we were walking down the cobbles, we saw the same group of German walkers we had seen in Winchelsea walking up! 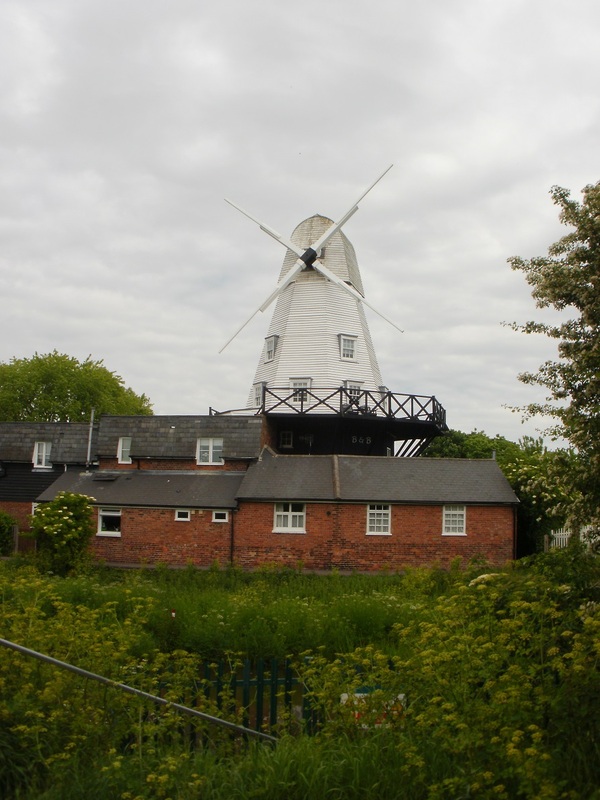 Without the caches to guide us around the town, we are fairly certain we would have missed seeing some of Rye’s rich history. All were easy finds apart from one, under a seat, where we had to wait patiently until several people had finished eating their fish and chips on the very seat we wanted to search under! 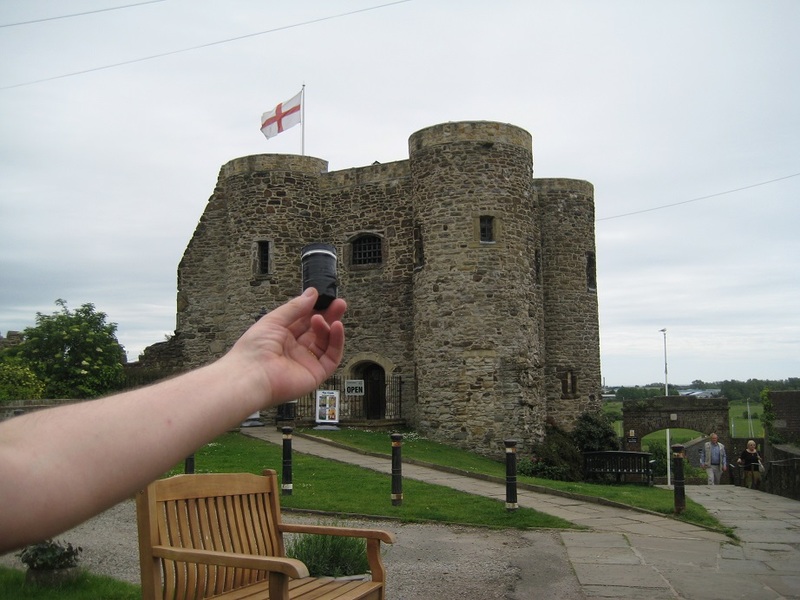 All our caches so far had been in Sussex, but our final destination, Lydd, was in Kent. We drove there, passing Camber Sands Holiday Park, and then some very imposing Army Ranges. 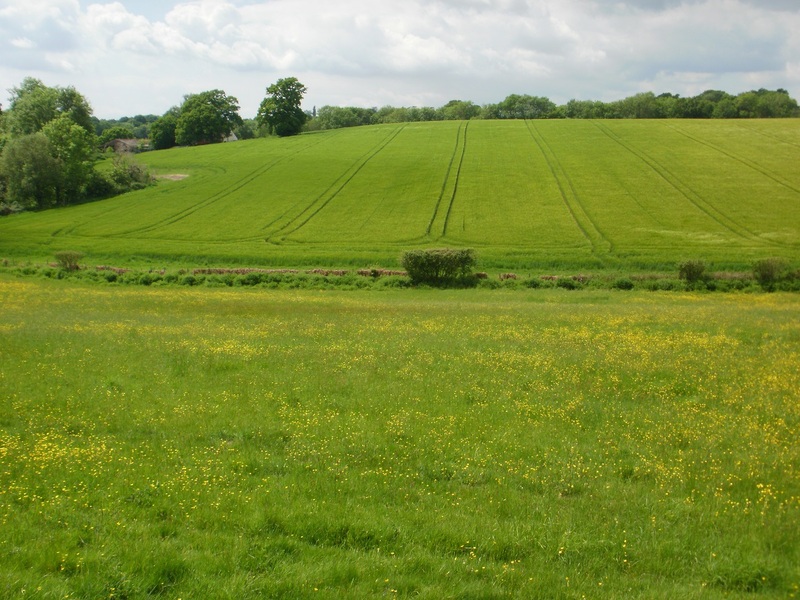 These Ranges straddled the Sussex-Kent county boundary, where a cache had been placed. Sadly nowhere to park a car satisfactorily. 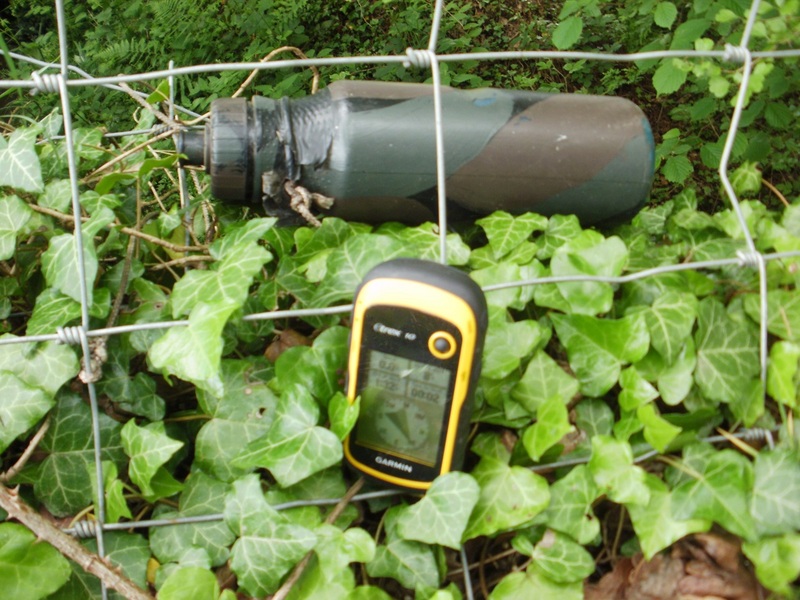 So Mrs Hg137 got out to search for the ‘County Boundary’ cache. Mr Hg137 sat parked in the roadside thinking every car was passing just a bit too close, and with only the concrete blocks and barbed wire surrounds of the range to admire – it was definitely not ideal. What wasn’t ideal either was the length of time Mrs HG137 was away…. she searched, and she searched and she searched.. all to no avail. So a wasted 20 minutes all round. 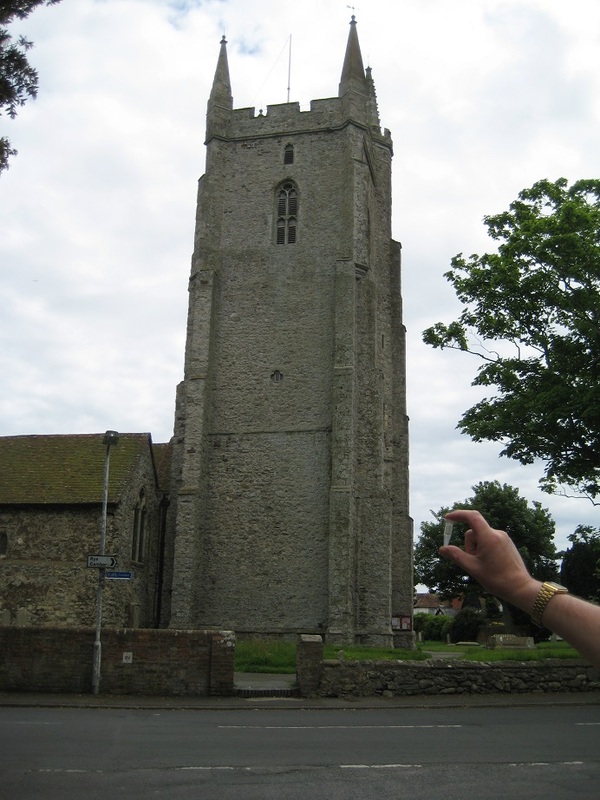 We had two target caches to find in Lydd. One a Church Micro, hidden in a street sign. The other was at the far end of the village green. 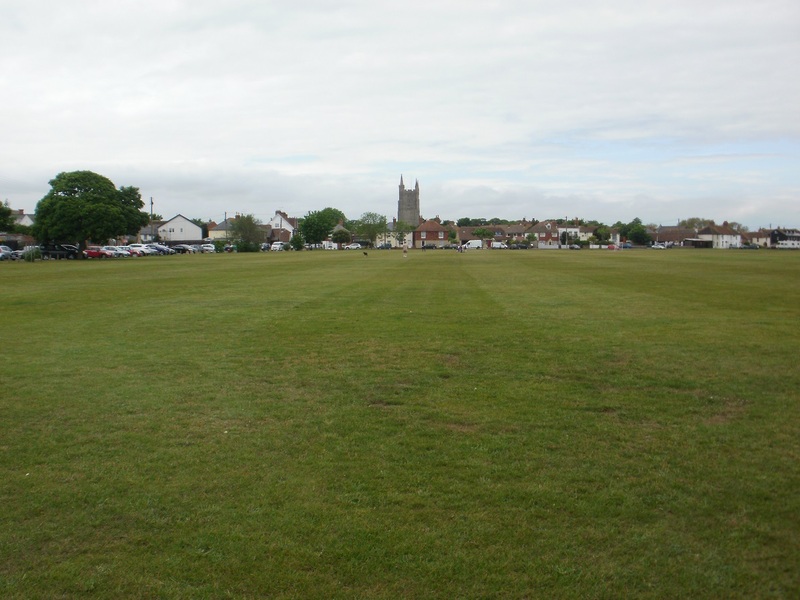 Lydd Village Green is huge, well over half a mile long. And we were the wrong side of the half mile! This was our hardest find of the day, as there no hints, and at GZ was a prominent tree. We searched it at length, before we noticed some nearby park furniture. Success! 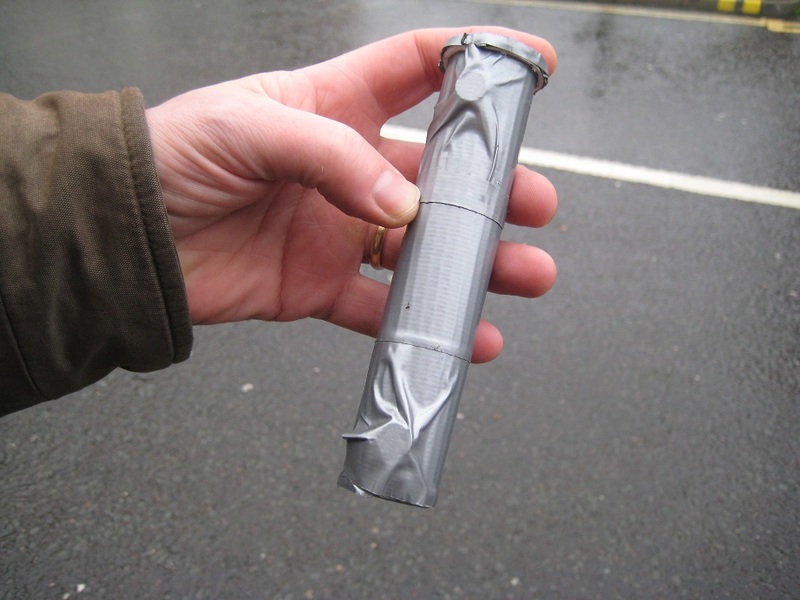 So we had found caches in Winchelsea, Rye and Lydd. We looked at the watch and decided Dungeness was just a bit too far. So instead we drove back to our hotel via (Old) Winchelsea (ie the settlement now actually by the sea). We stopped for our fourth Church Micro of the day (again, far too long a search), before spending a relaxing 15 minutes overlooking the sea. We were bemused by a line of fishermen standing at the distant shore edge. What were they doing ? Fortunately as we sat another fisherman went by… he was off to collect lugworms. 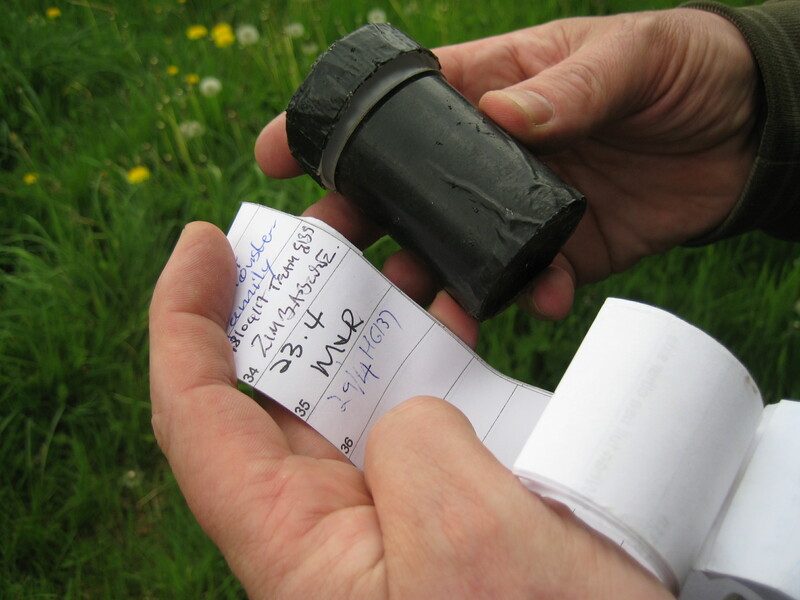 We had been collecting film canister caches near churches, windmills, and stations all day and the fishermen were collecting lugworms to be sold as bait for other fishermen. Isn’t life strange! May 21st … the start of a week’s holiday in Hastings. 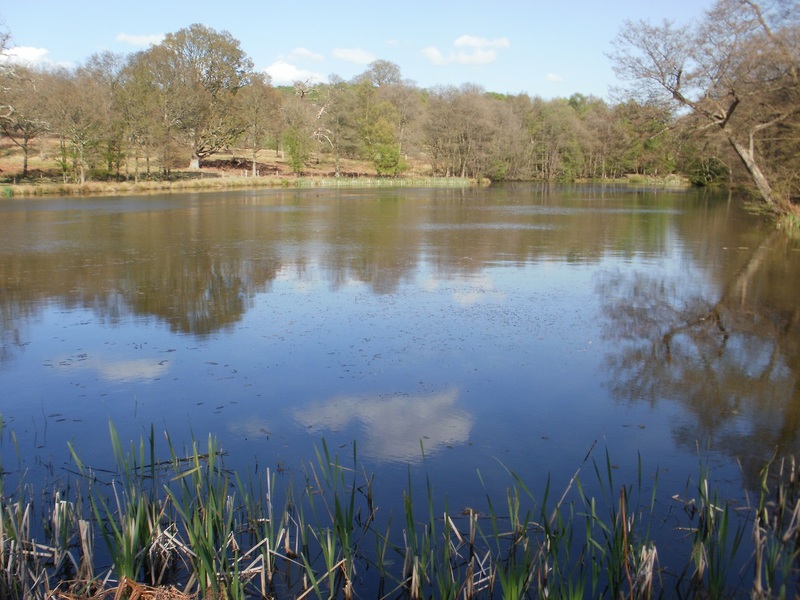 We planned to look round the area, do some of the ‘tourist stuff’ was planned, and also to finish off our unofficial, self-made long distance path from Sandhurst (just in Berkshire) to Sandhurst (just in Kent). 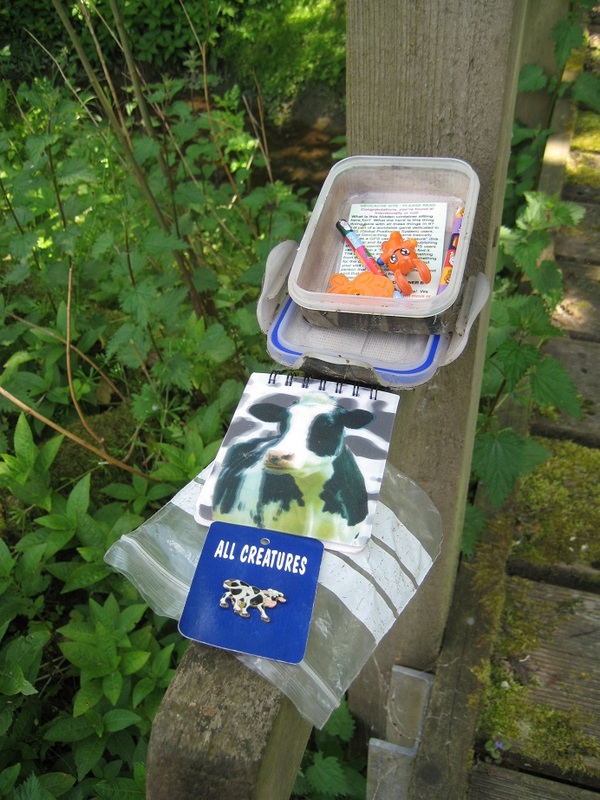 All our caches for today, except the last, were to come from the ‘Tidebrook Trail’ series. 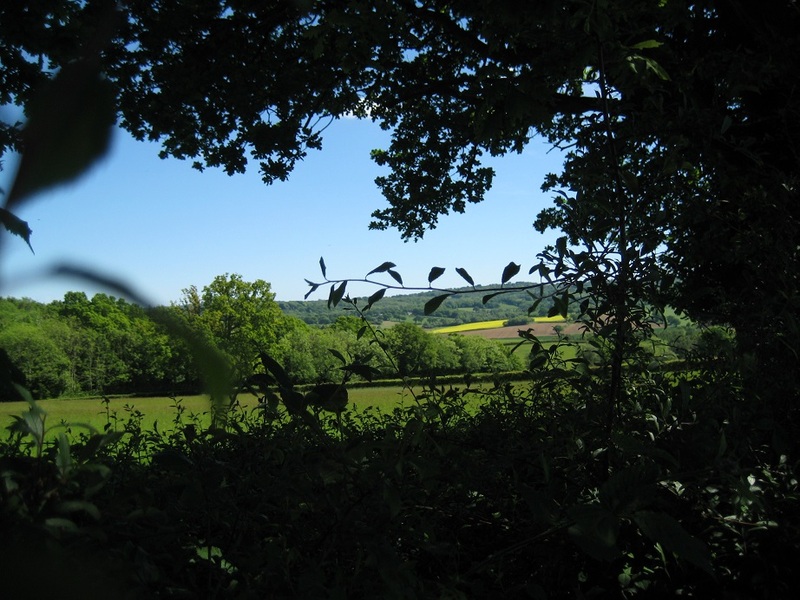 We found the first, then stopped for lunch in a pretty patch of woodland near a stream – yes, I know we had just set off, but it had been a long morning, lots of packing to do – and then set off again through fields and woods in the sunshine. My, it was getting quite hot now! 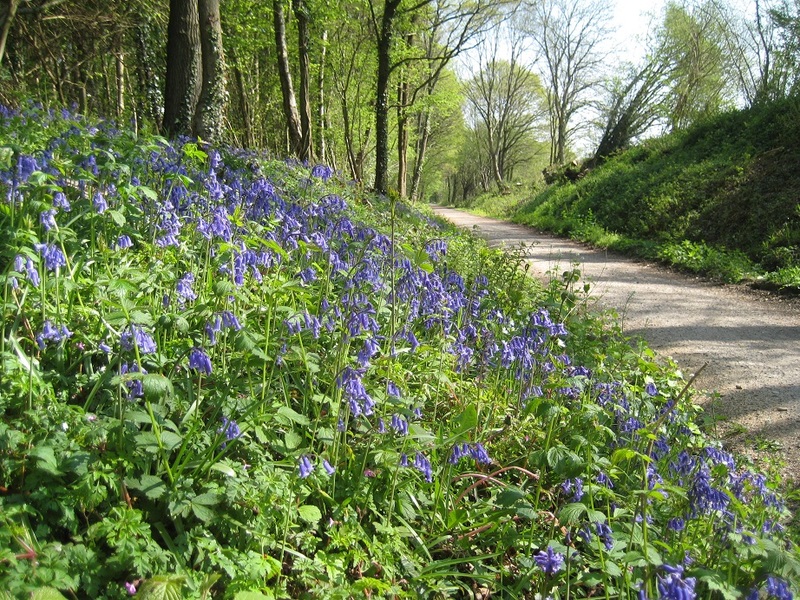 The path led on through a plantation of trees, planted in rows, upright in growth, with silvery leaves. 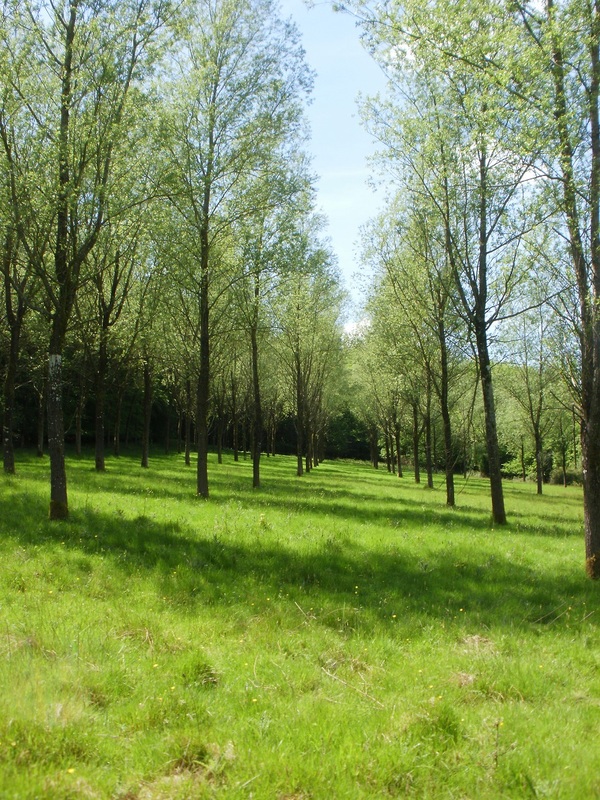 We didn’t know what they were, but a passing muggle said they were poplars, and that she could remember them growing up over the last 30 years, and that it was like an enchanted forest. 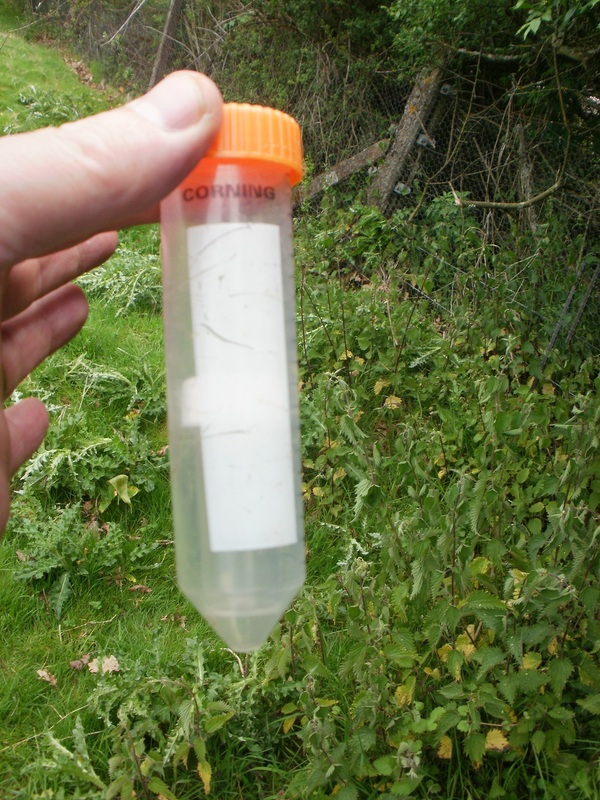 The second cache was easy to find, though surrounded by angry stinging nettles, and then it was on to the third, in a tree overlooking a (dry) ditch. I excelled myself here (twice), first because I failed to spot the cache even when I was a hand’s distance away from it, and then because I dropped the log into the ditch. Mr Hg137 nobly retrieved the log, then spent much of the rest of the walk remarking on my ineptitude and his altruism. Pah! We went on in the sunshine (it was quite hot now), through a mixture of fields and woods, finding more caches from the series as we went. The path went through Wadhurst deer park – the giveaway is the very high fences – I wonder why there are so may deer parks around here (there is one less than 10 miles away, near Frant). 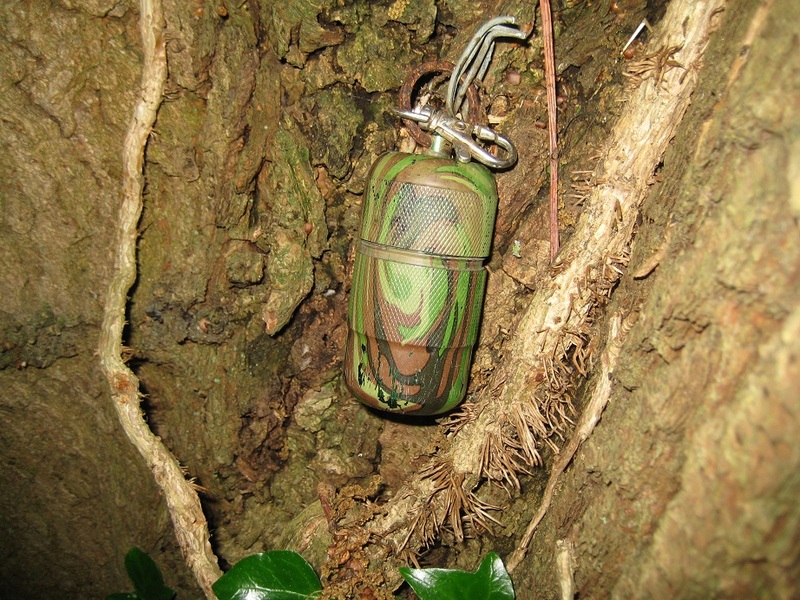 Another cache was found at the far edge of the deer park, then another at the edge of the woods. Here we turned left the Tidebrook Trail to head for the station. 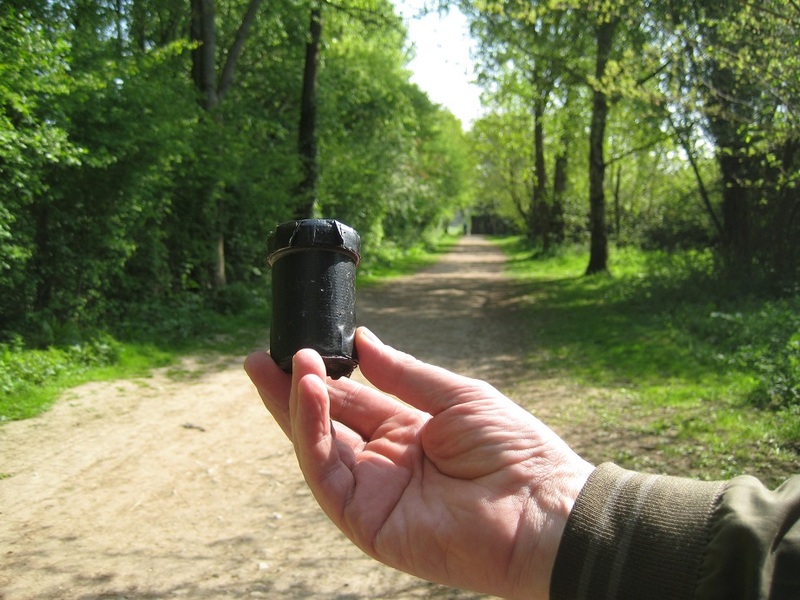 This cache series is excellent, one to try if you are in the area. 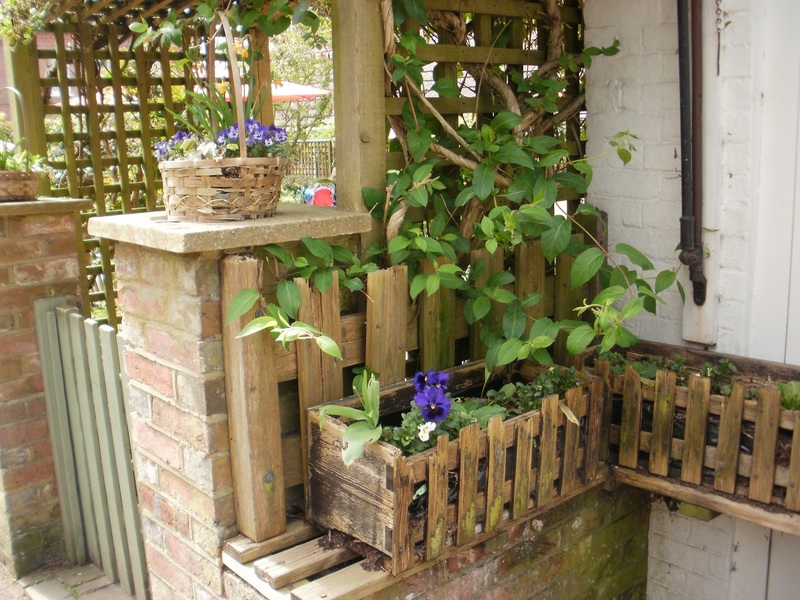 It passes though beautiful countryside, has a variety of caches, both in hiding place and type of container, and is also well maintained by the owner, with clean/dry/not full logs. From here it was just a walk downhill along a track and a mixture of quiet country lanes and tracks, more woods and fields, before we emerged onto a busier road close to Stonegate station. “Busier” meant that there was traffic, but not much, and most of it travelling to or from the station. 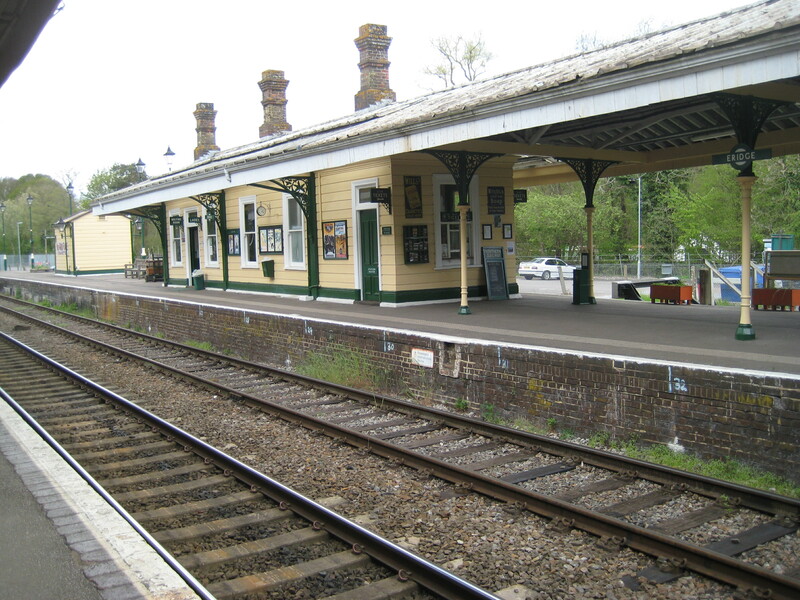 The station itself is in the middle of the countryside, at least a mile from Stonegate village. It has quite a large car park, so I guess it is mostly used by commuters in the week. 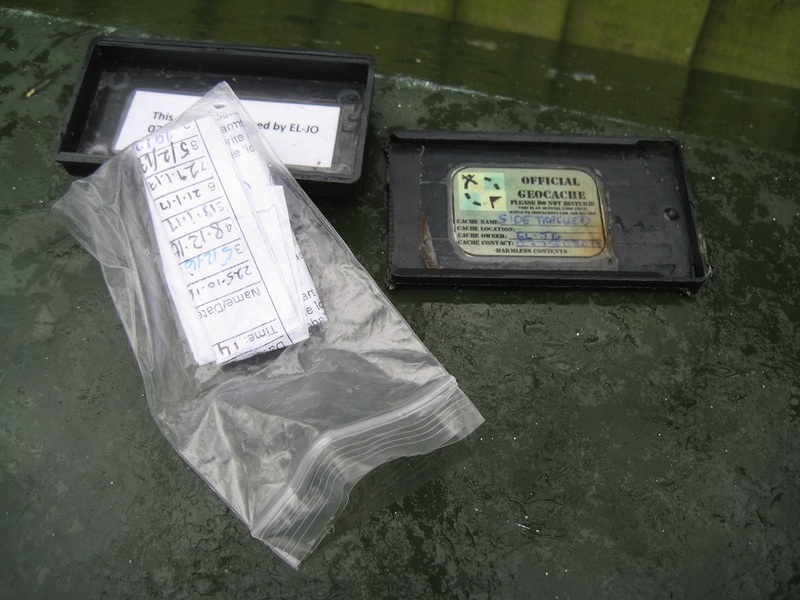 Being a station, it had its own geocache, one of the ‘Sidetracked’ series placed near current/disused stations. 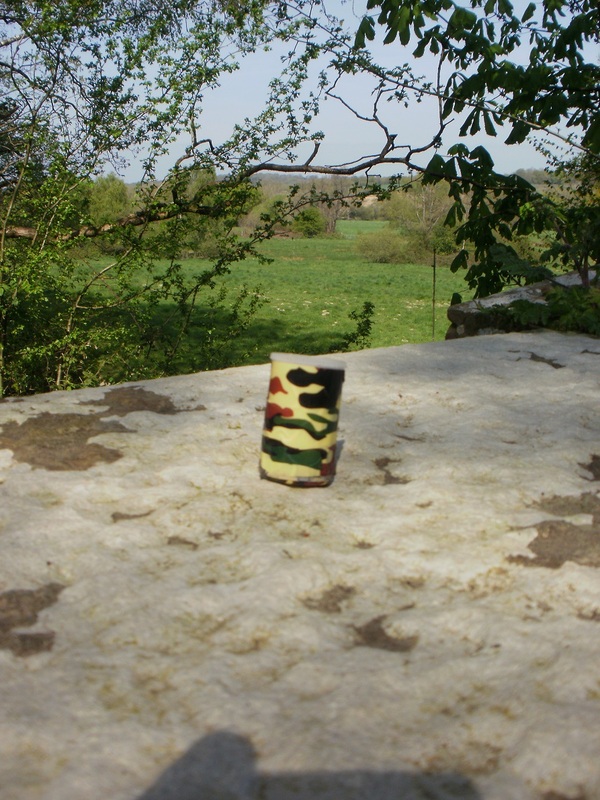 We took quite a while to find this cache, as we didn’t understand the hint, couldn’t work out exactly where it was, and generally behaved like two tired, hot people. 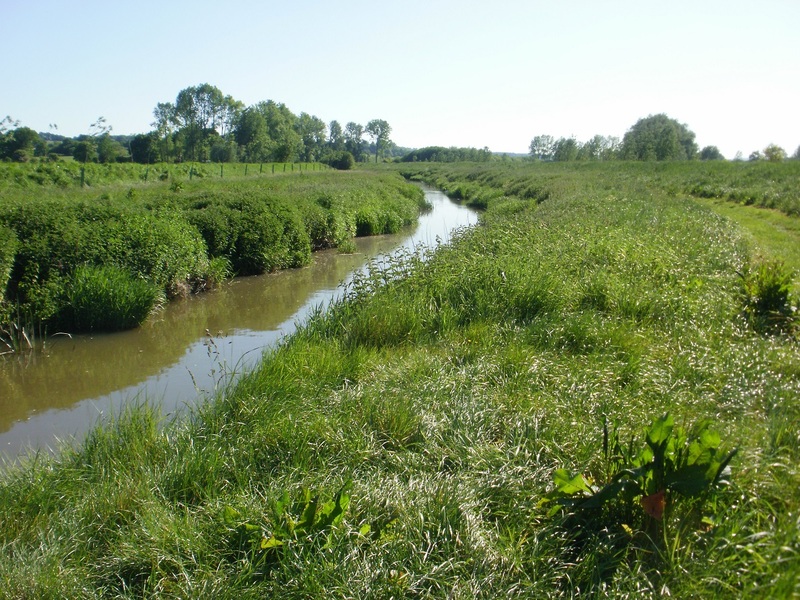 Eventually we found it, behind some nettles. Ouch! And those nettles must have done a lot of growing in the week since the cache was last found, as they didn’t even get a mention then! So that was our walk/caching done for the day, and only about 15 miles to drive to the hotel where we were staying, on the northern edge of Hastings. 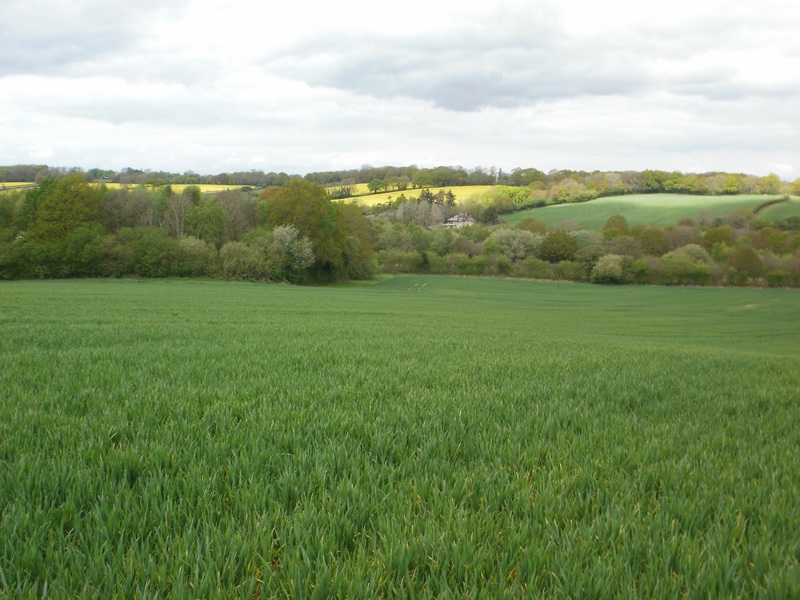 The next stage of our unofficial, self-made long distance path from Sandhurst (just in Berkshire) to Sandhurst (just in Kent) would take us across the Weald from Withyham to Frant. We’d checked our route for geocaches – and there weren’t that many – so we couldn’t simply walk from cache to cache, following the GPS. And, for much of the way, we weren’t following an official waymarked route, so a bit more navigation was going to be needed. Plenty of scope for getting lost here! We set off from the disused Withyham station. There was a cache here – or rather, there was the first part of a multi-cache here, with the final cache location a short walk away, unfortunately not in the direction we planned to go. 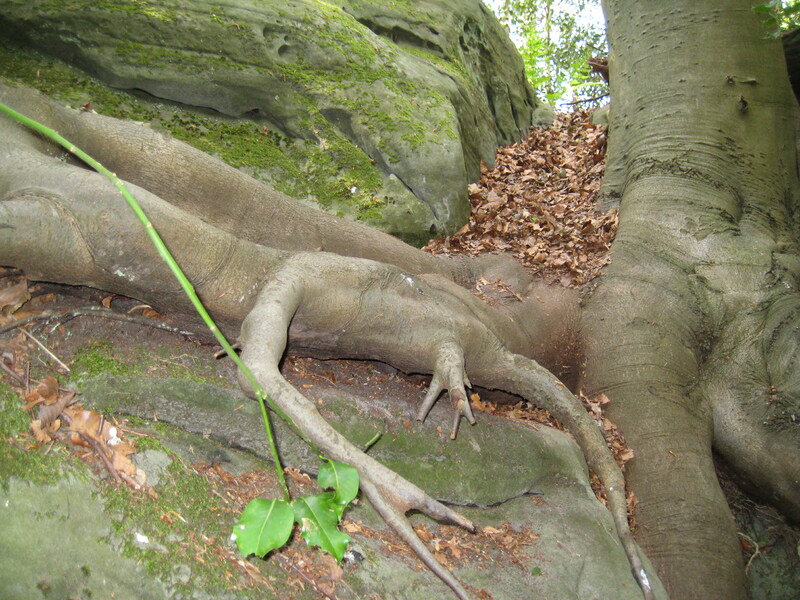 We backtracked and found the cache after much furtling around in tree roots. While doing this we were passed by a young couple, out walking … then we passed them again, while searching … then again. Eventually we explained what we were doing, as they were probably wondering what we were doing. Close by was another cache; we found that too. Good, so that was two caches found, and we hadn’t even started the walk properly yet. Now what? Lunch! We’d had a not-very-good journey to the start of the walk – I’d got lost THREE times on the way, mostly in Tunbridge Wells (why are there no useful road signs there, none at all?) so we were rather late setting off, about, ummm, an hour later than we intended. There were no more caches to be found for three miles, so we had a chance to catch up with a cacheless walk. 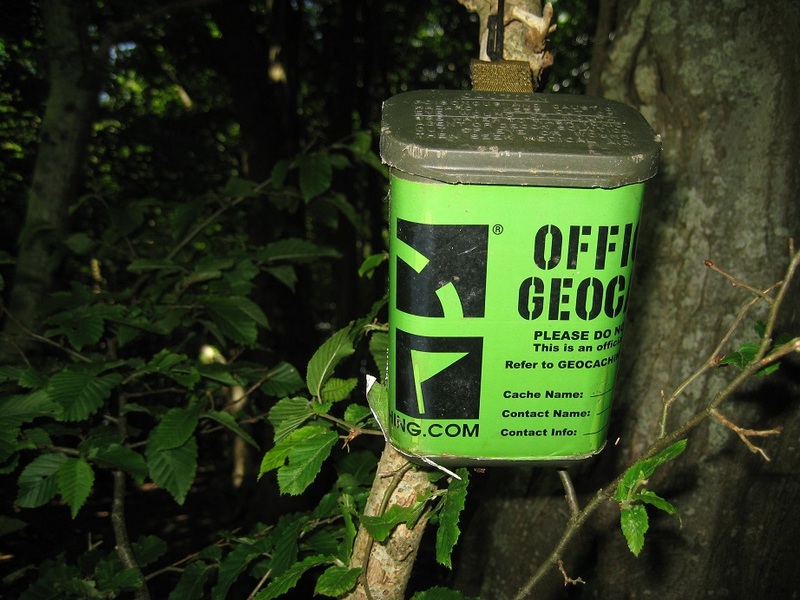 Why are there so few caches in this area? No idea. Leaving the railway line, we headed uphill, over a road and across country to Motts Mill, then joined the High Weald Landscape Trail https://en.wikipedia.org/wiki/High_Weald_Landscape_Trail We headed towards Eridge station, which is a curious mixture – one line is a British Rail station, the other is a heritage steam railway. We heard a train arrive then depart, and saw two people walking towards us. One was carrying … it was enormous … what? A mattress? We had no idea, so we stopped to ask, and the ‘mattress’ was duly unzipped and displayed to us. It was a very large foam mat. The people were climbers, heading for Harrison’s Rocks, a well known (not to us!) climbing site http://www.cumc.org.uk/crags/harrisons.html The mat was to provide a softish landing in case the climbing went wrong. We, too paused at Eridge station, which is an interesting place – as with the trains, one platform is all modern signage, metal seats, automated announcements, today’s world, and the other platform, just the other side of the tracks, has a slightly different colour scheme, wooden seats, signs on chalk boards, and exudes a completely different time and character. We went under the busy A26, then crossed again (twice) at road level, to find a cache at Eridge rocks, which are tucked away in woods by the road. 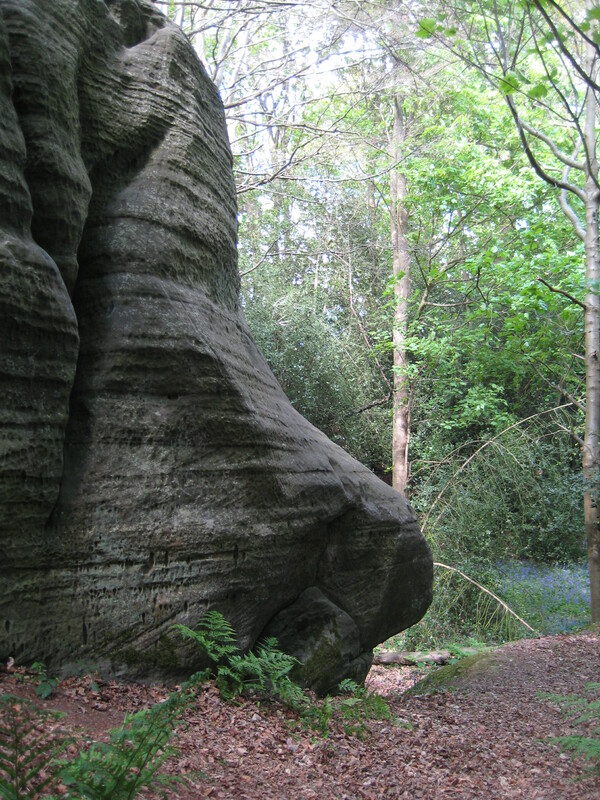 A good little rocky outcrop, with shapes in the rocks and trees that resemble animals and faces. You really would not know that there was anything unusual there, so well is it hidden. And that was the third and last cache of the day. 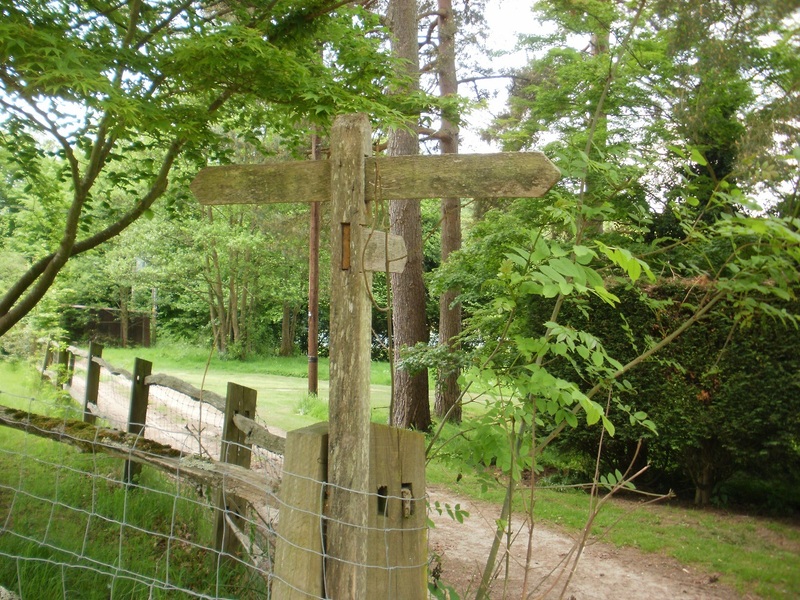 But we still had some way to go to Frant, the end of the walk. As soon as we left the A21, the traffic noise died away and it was a bright warm spring afternoon. Loverly! We left the tarmac and walked through woods. Somewhere here Mr Hg137 disturbed a shrew/vole, and let out one of his ‘all purpose distress squeaks’ while the shrew/vole ran away, fast. Deer – look carefully, they are there! 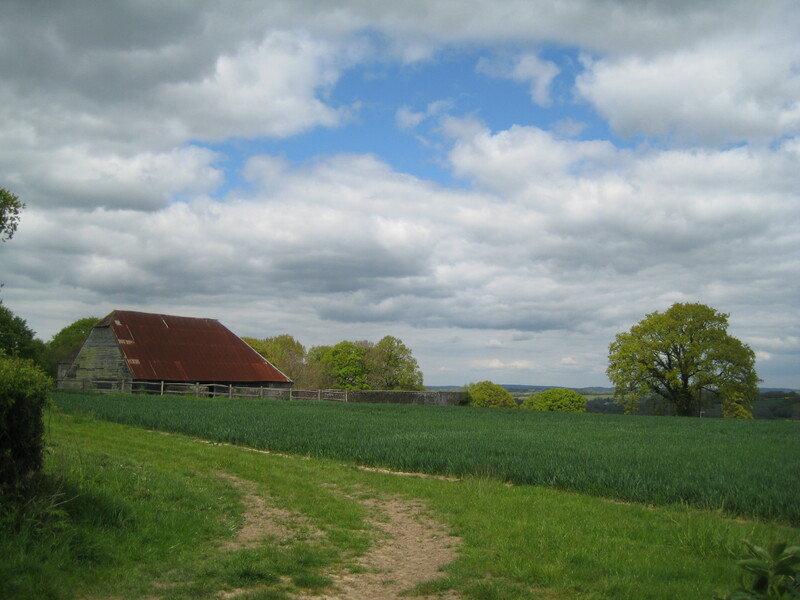 On we went, climbing steadily towards Frant. 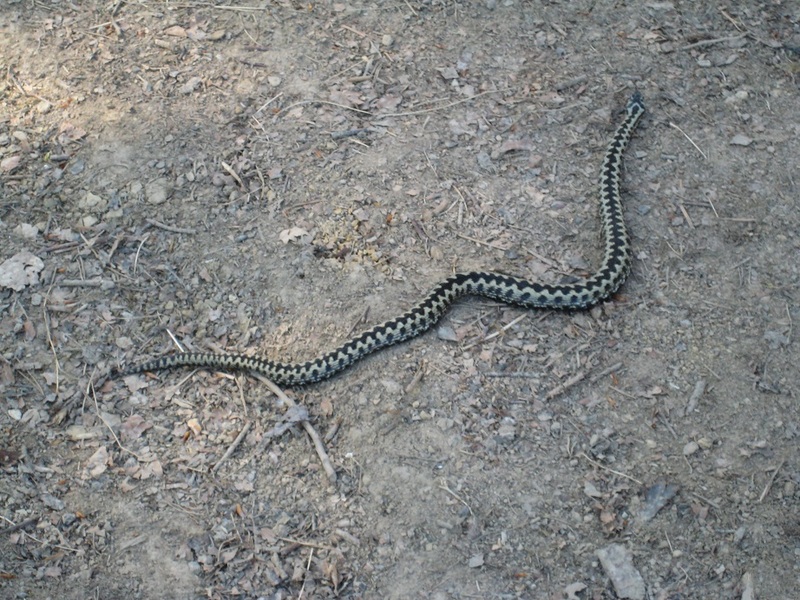 Suddenly another, much louder ‘all purpose distress squeak’ rang out, followed by “SNAKE!” A yellow and black snake, about the length of my arm and a little thicker than my thumb, was sunning itself on the dusty path. We watched the adder from a pace or so away, and it slithered away into the grass without urgency. A steep climb out of the deer park brought us to journey’s end, Frant village, where the geocar was parked by the cricket pitch. 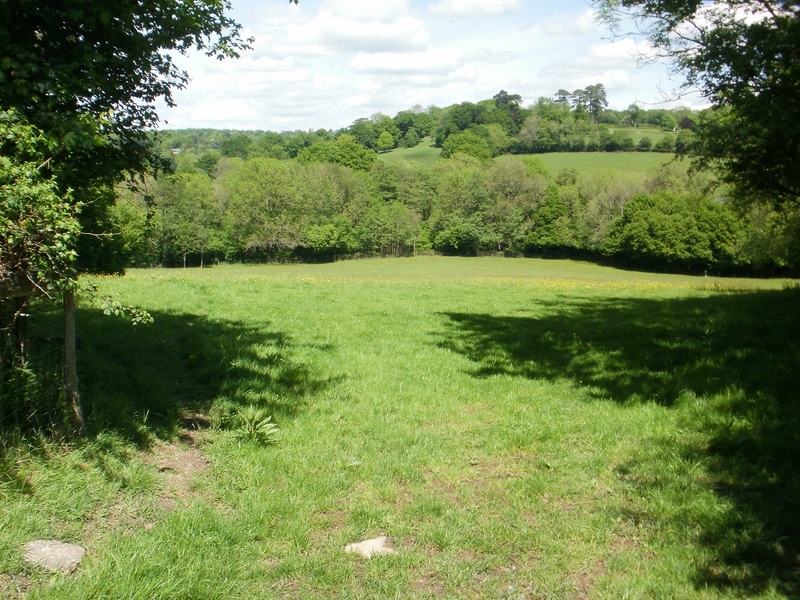 Not many caches on this walk, but a good, scenic route, with loads of wildlife, varied terrain, and some cracking views, especially from Frant. 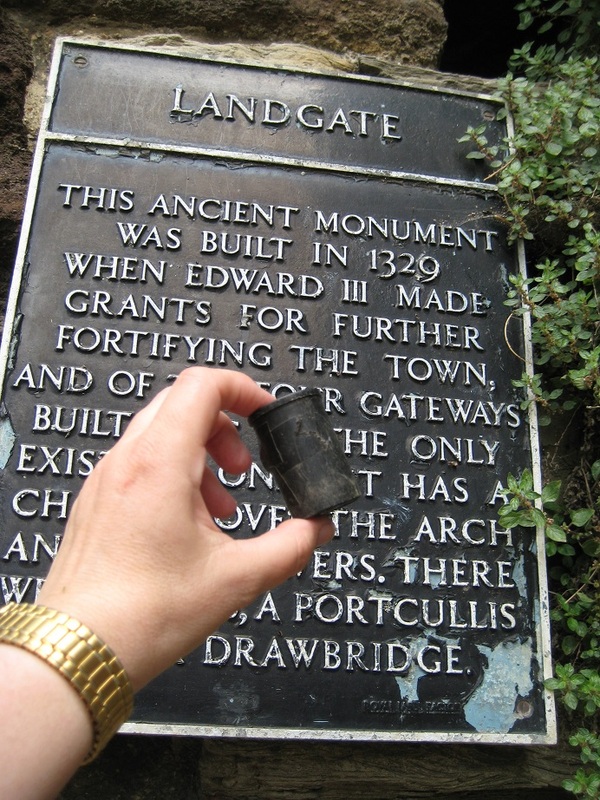 We caught the 291 Metrobus to Forest Row, walked out of the village, collecting the first cache of the day, a black-tape covered pot under a lump of concrete (we would see quite a lot of those!) and we were up on the old line. 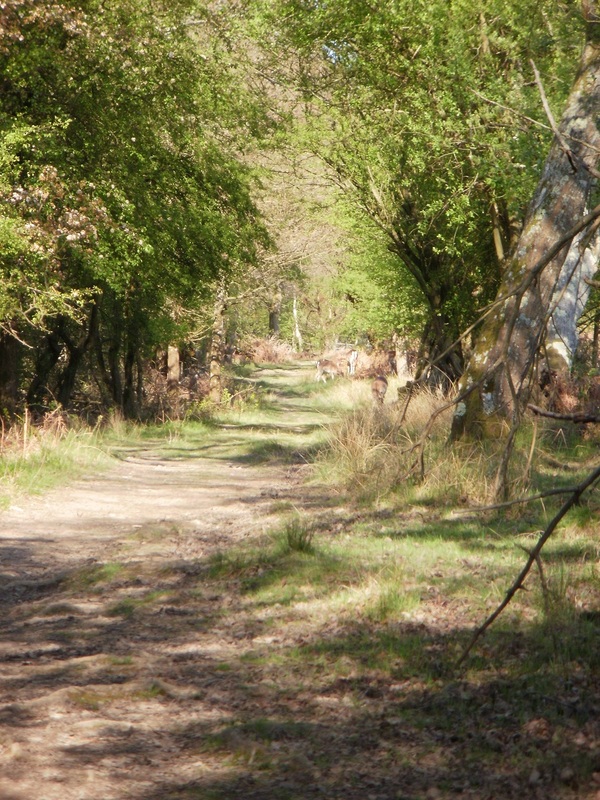 It was a Thursday and we were expecting it to be quiet, but the path was full of walkers, dogs, joggers, and cyclists, some out for a stroll, and some using the old track as a route to somewhere else. As we cleared the outskirts of Forest Row, the people thinned out and we were nearly alone, save for cyclists, for this is also long-distance cycleway 21, 94 miles from Greenwich to Eastbourne http://www.sustrans.org.uk/ncn/map/route/route-21 and also part of the Avenue Verte which links London to Paris via the Newhaven-Dieppe ferry. 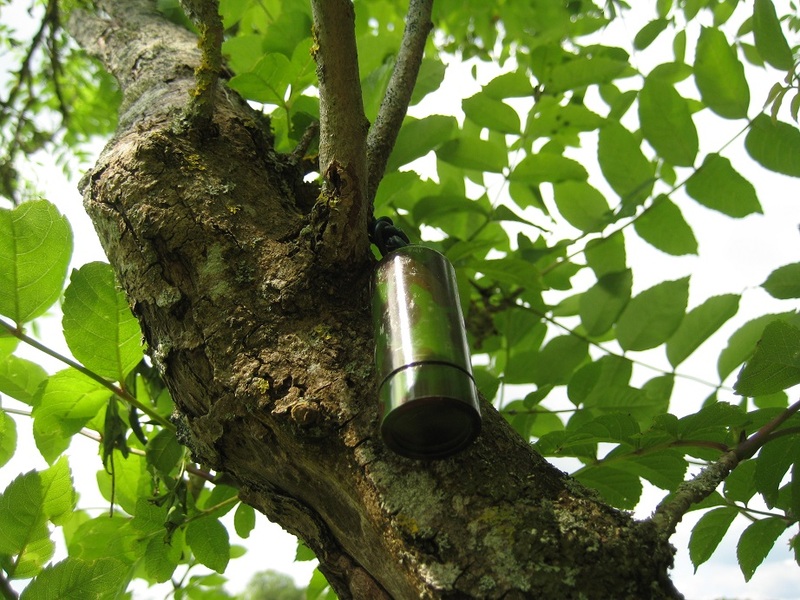 And the geocaches … well, there are a lot of excellent cache series around here, which weave in and out of each other. 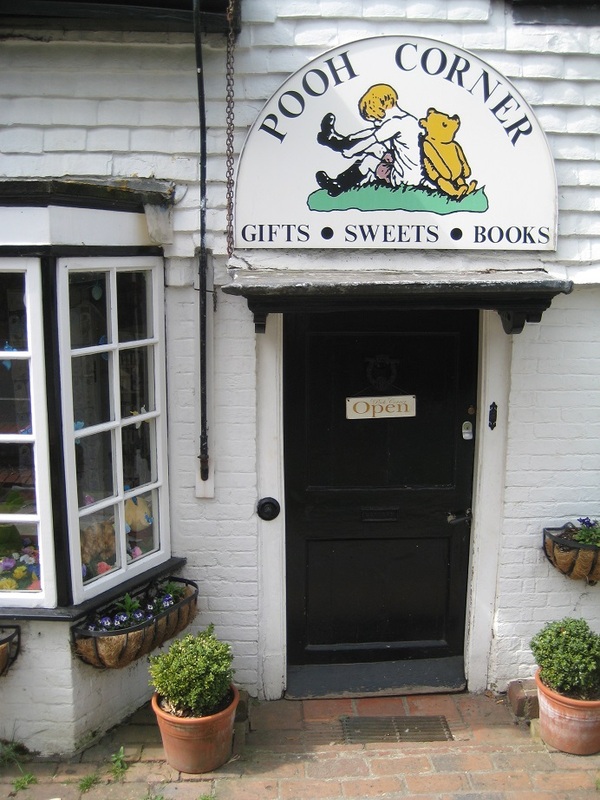 We found caches from the Forest Row, Hartfield, and Withyham Link series, and the Pooh Trail (for this is part of Ashdown Forest, home of Winnie the Pooh, Piglet and Eeyore). Almost the caches were film pots, hidden under bricks, lumps of concrete, or railway clinker, and were very easy to find, but that didn’t matter at all, for it was a glorious spring day with the trees frothing into leaf, bluebells in flower at the side of the track, and spring bursting out all over. 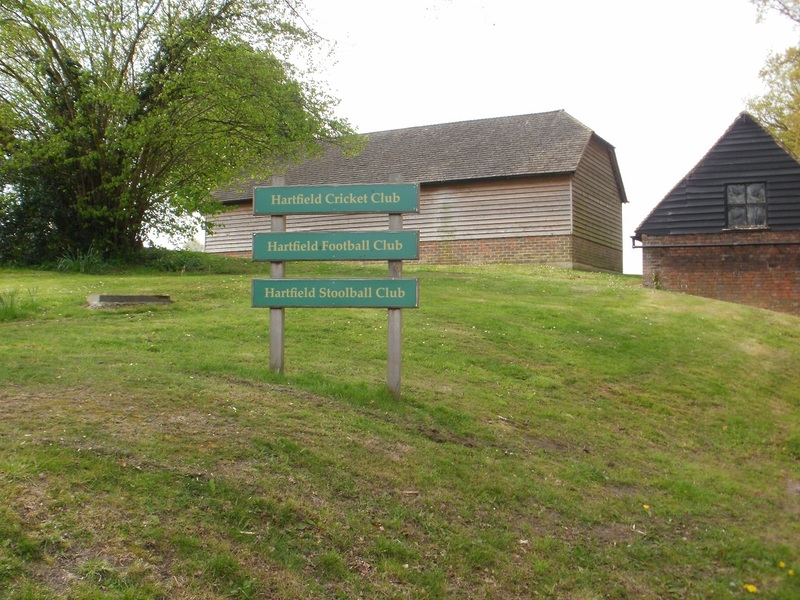 After about four miles walk along the railway, we approached Hartfield, and took a short diversion into the village http://www.hartfieldonline.com As we walked uphill from the old railway line and the valley of the infant River Medway, we were overtaken by six teenagers with huge rucksacks. Aha! Duke of Edinburgh award time again! 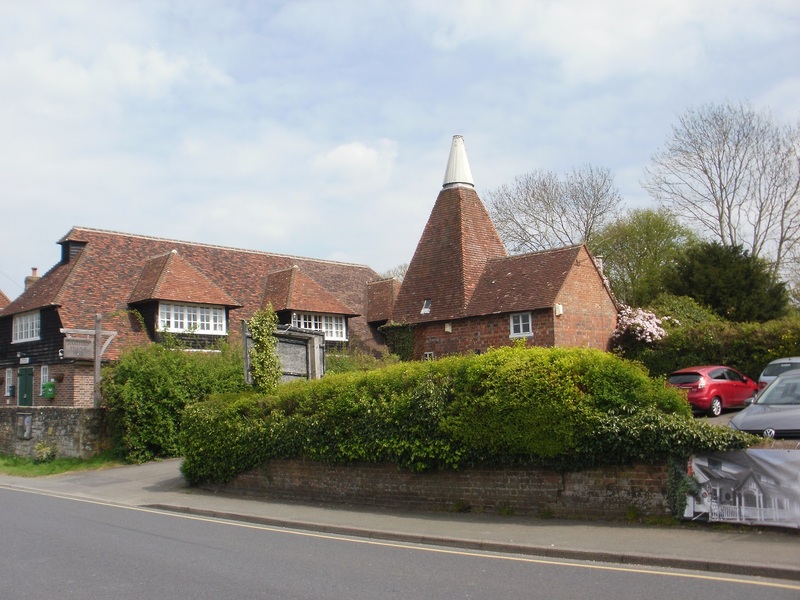 The village is compact and attractive, with timber and tile-hung houses, and the first oast house we had seen. We were obviously approaching Kent at last! Hartfield church sits atop the hill. We chose this as a good spot to eat lunch, on a seat in the churchyard in the warm spring sun, listening to the children in the adjoining school. 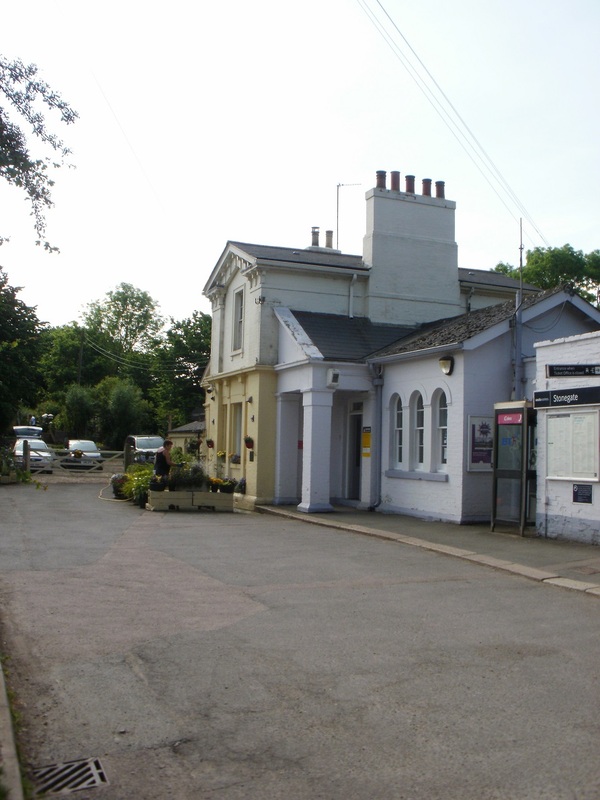 We meandered back through the village, passing the pub http://www.anchorhartfield.com and the village shop, then returning to the railway line near the disused Hartfield station, now a private house. It was now only a couple of miles to Withyham. Leaving the railway line at another disused station, we walked the short distance back to the geocar for the drive home. 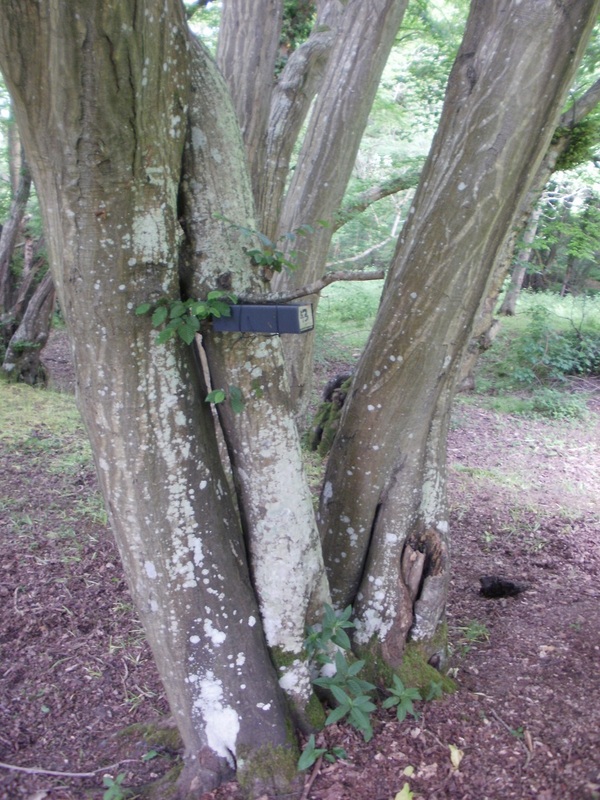 Eighteen caches found, and a lovely walk in the Sussex countryside.